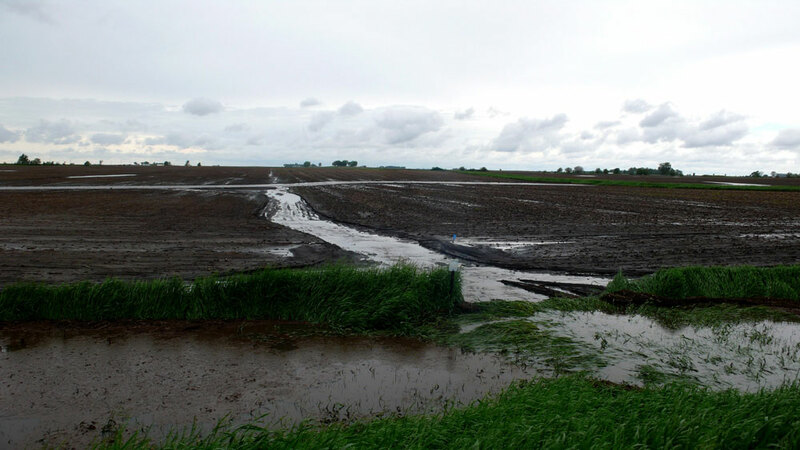 In what has become the wettest spring on record, a series of heavy rains rolled across Iowa between May 25 and May 29, delivering 1-to-2 inches of rain to most of the state, and localized amounts of as much as seven inches in several areas. 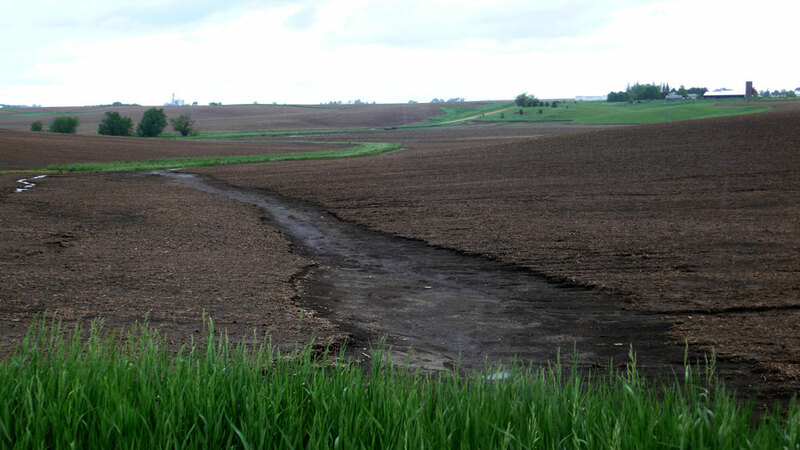 Iowa State University’s unique and important Iowa Daily Erosion Project (IDEP) suggests just how heavily damaged Iowa’s soil and streams were over this five-day period. 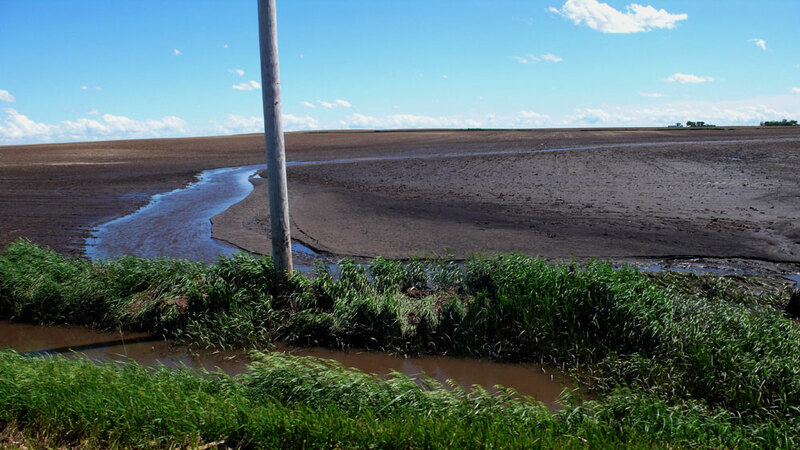 In 50 townships covering 1.2 million acres, farmland suffered average erosion of more than 5 tons per acre over that five-day period. 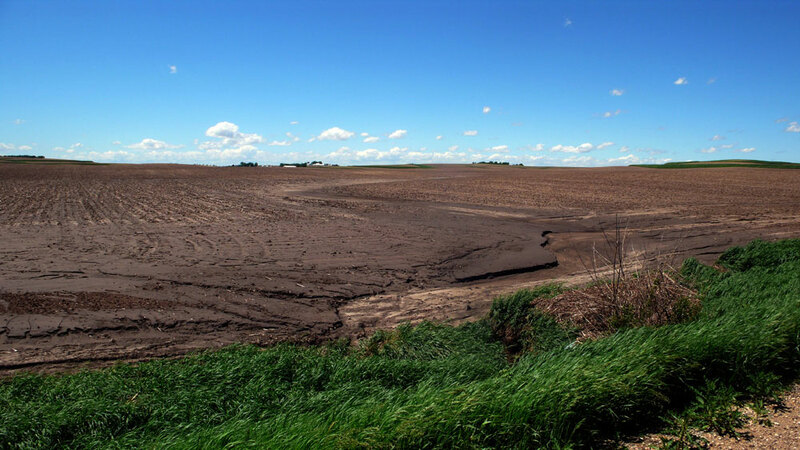 In 15 of those townships encompassing 346,000 acres, fields suffered average erosion of 7.5-to-13 tons per acre – far more than the annual rate of 5 tons/acre considered “tolerable” for most Iowa soils by USDA’s Natural Resources Conservation Service. 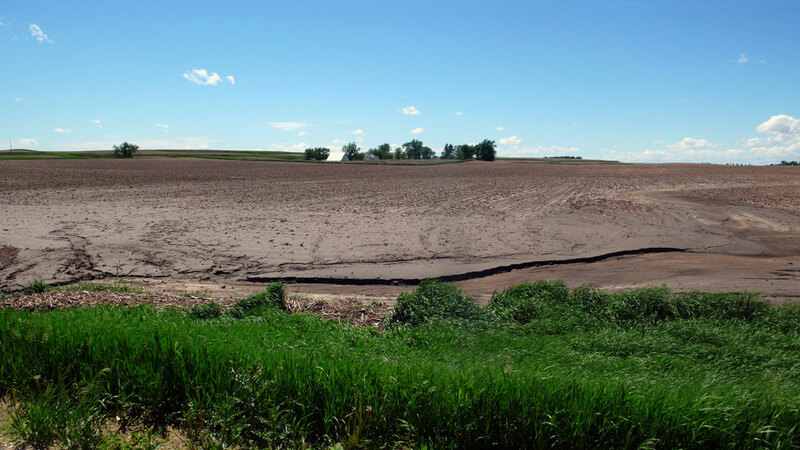 In other words, those 1.2 million acres of farmland may have lost more precious topsoil in five days than what is tolerable over an entire year. And most soil scientists think that a truly sustainable rate of erosion is far lower. 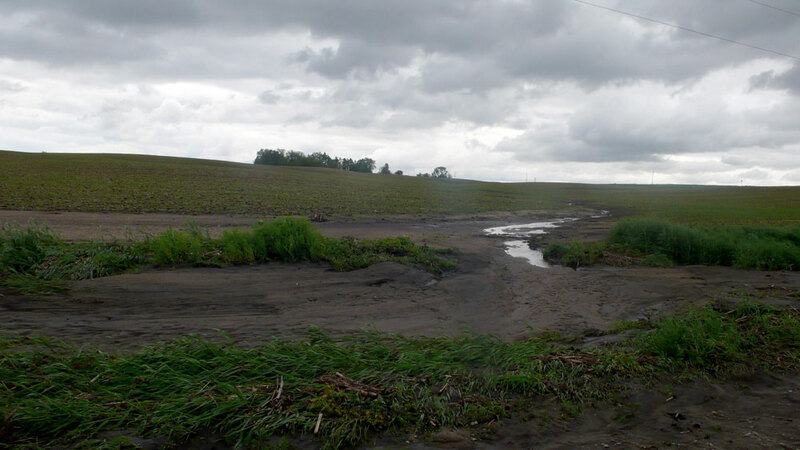 On vulnerable and/or poorly protected farmland, the IDEP data paints an even more disturbing picture of catastrophic rates of erosion and runoff. 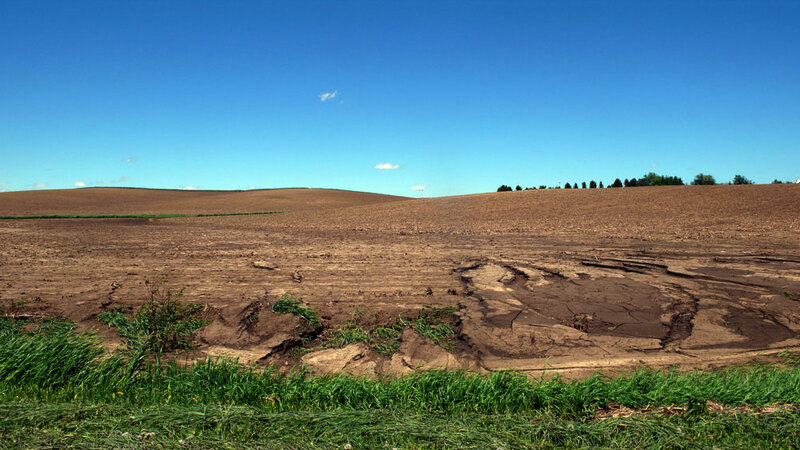 In 115 townships, the hardest hit fields lost more than 20 tons of topsoil per acre in less than a week. In 16 townships, the most vulnerable and/or poorly protected fields may have lost a devastating 40 tons or more soil per acre that week. 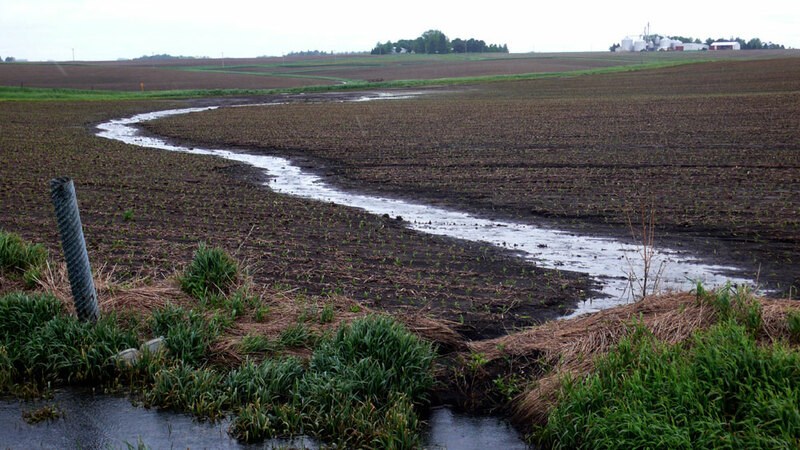 Though this spring was particularly dangerous, storms ravage the Midwest’s fertile soil and streams every year. 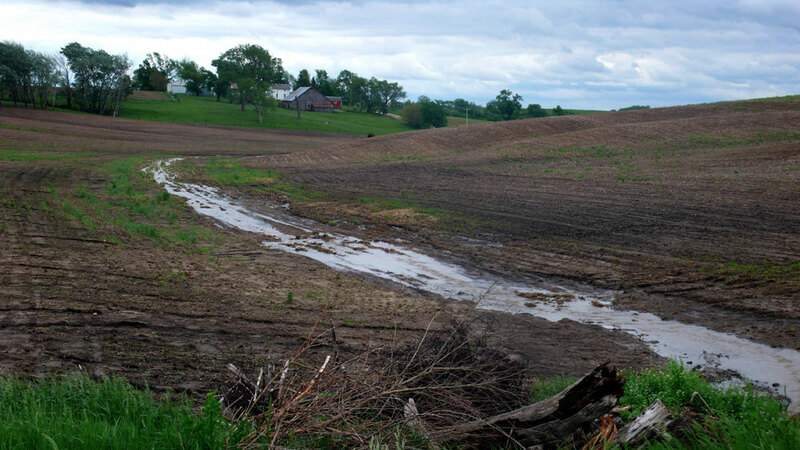 In April 2011, EWG’s Losing Ground report and website analyzed the Iowa State erosion data for the period between 2002 and 2010. 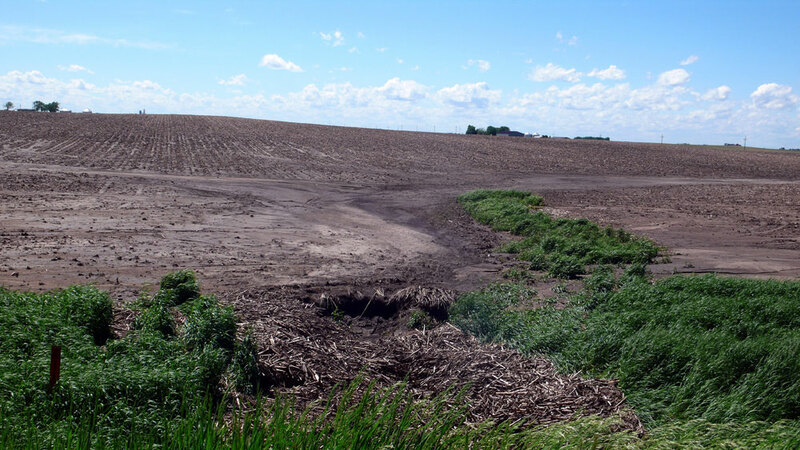 It showed that some parts of Iowa suffer serious damage nearly every year, and almost all Iowa farmland had suffered damaging erosion at some point between 2002 and 2010. 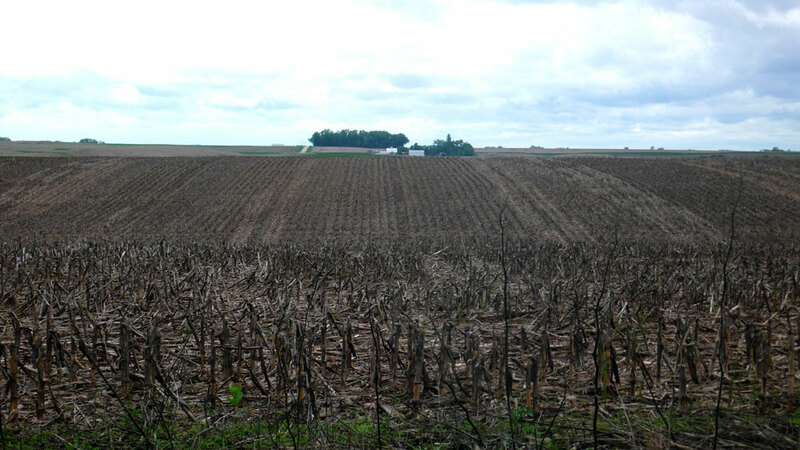 The IDEP data covers only the state of Iowa, but the same situation is occurring throughout the Corn Belt. 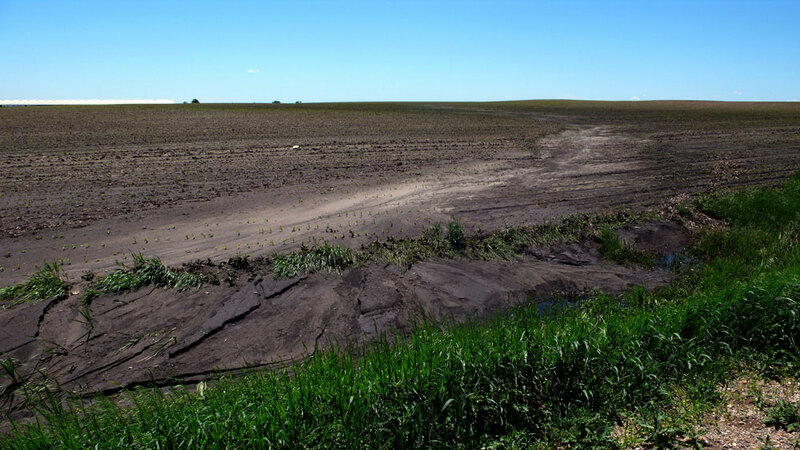 Soil erosion and polluted runoff are actually worse – likely far worse – than even the IDEP estimates, because the project cannot currently account for the erosion and runoff caused by ephemeral gullies. 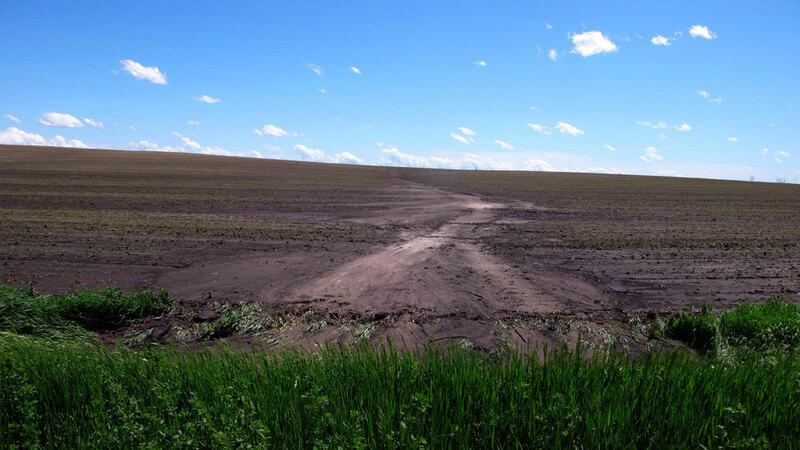 These gullies – called ephemeral because farmers refill them temporarily with tillage each spring – appear quickly when runoff water flows through the lowest parts of a field and cuts a channel through unprotected soil. 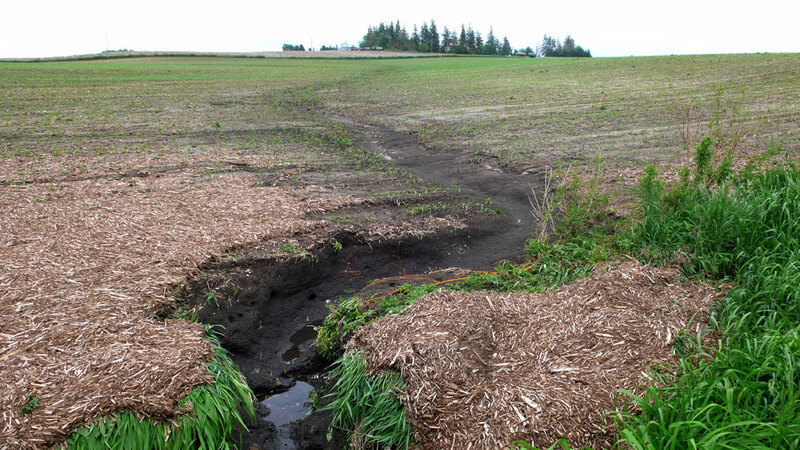 This gully erosion is the most visible and most damaging form of soil erosion because it creates a direct pipeline carrying mud and farm chemicals into ditches, streams and, in some cases, into underground drainage systems. The picture the IDEP data paint is devastating, but the reality on the ground is worse. 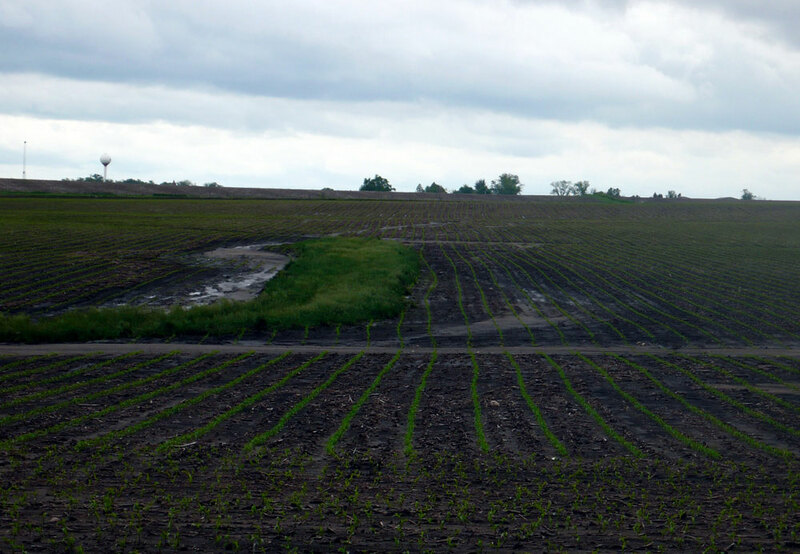 To see how bad things looked on the ground and to evaluate how well conservation practices stood up to the heavy rains, EWG staff took a road trip on May 30-31, 2013. On May 30 they drove a random loop through five counties east of EWG’s Midwest office in Ames, Iowa. The next day they toured a couple of counties to the west. On both days they found gullies scarring field after field. 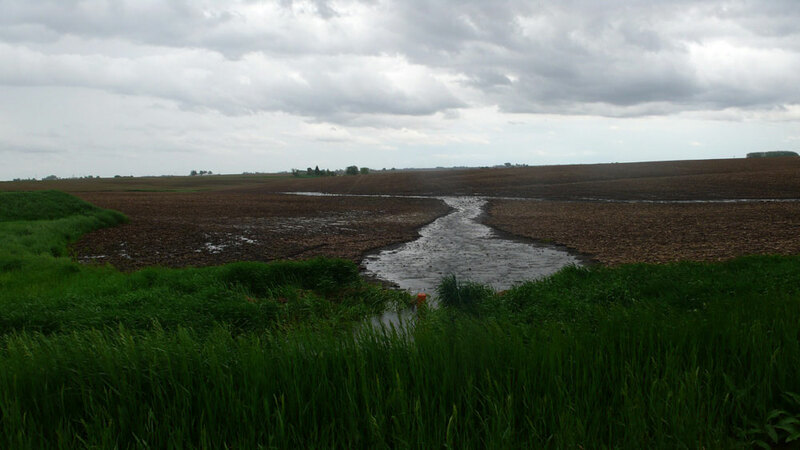 Roadside ditches were full of mud and polluted runoff – a very bad sign for Iowa’s already polluted streams. An aerial view would have revealed more gullies delivering pollution directly to streams and rivers out of sight of public roads. 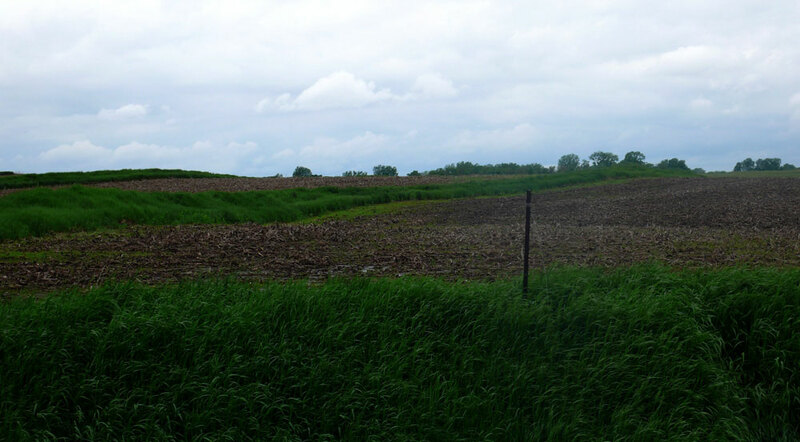 Over the two days EWG staff took photos to record examples of the various types of erosion and conservation systems visible along Iowa’s rural roads. The location of each photo was recorded by a dot on an interactive map (below). Cropland considered highly erodible is shaded in blue. The tour revealed widespread serious erosion everywhere, not just on land considered highly erodible. To see the photos taken at each location, click on the colored dots on the map below. Most of the photos – including several hundred that were not included because they are too repetitive – depict an ugly picture of excessive erosion and runoff. 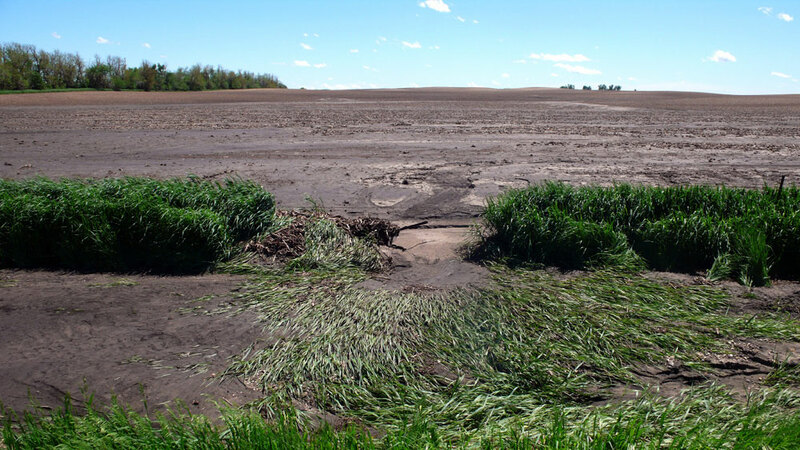 The majority of fields observed during several hundred miles of driving were poorly protected and suffered badly under the pounding rains. Click on colored dots to see photos of each site. Click to see a larger version of the map. The images are also available in a simple slide show format. This grass waterway needs maintenance. Water now flows around the remaining grass as gullies traverse the field in both directions. 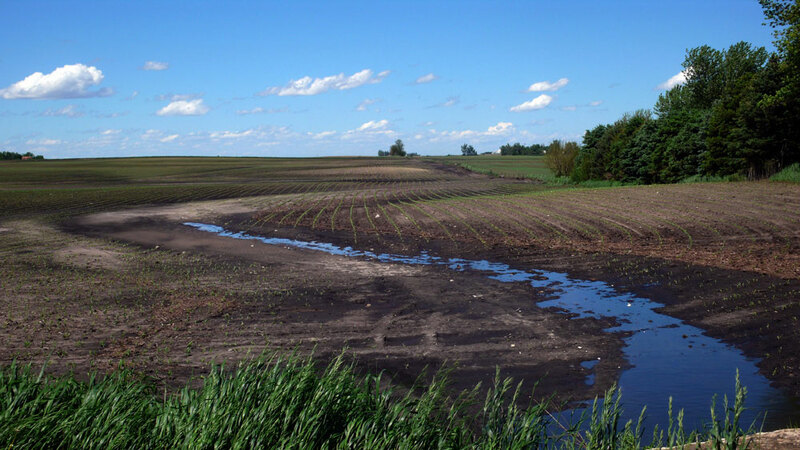 Note that the corn was planted right through the waterway, which will further hasten its decline. Road ditch filled with several tons of soil washed from the adjacent field. The same thing is happending to streams across the state. Deep, narrow gullies have been etched in this sloping and unprotected field. Three broken grass waterways are surrounded by gullies. The light soil at the bottom of the image is several inches deep and ran off the field in a single rainstorm. Multiple deep gullies scar this field. 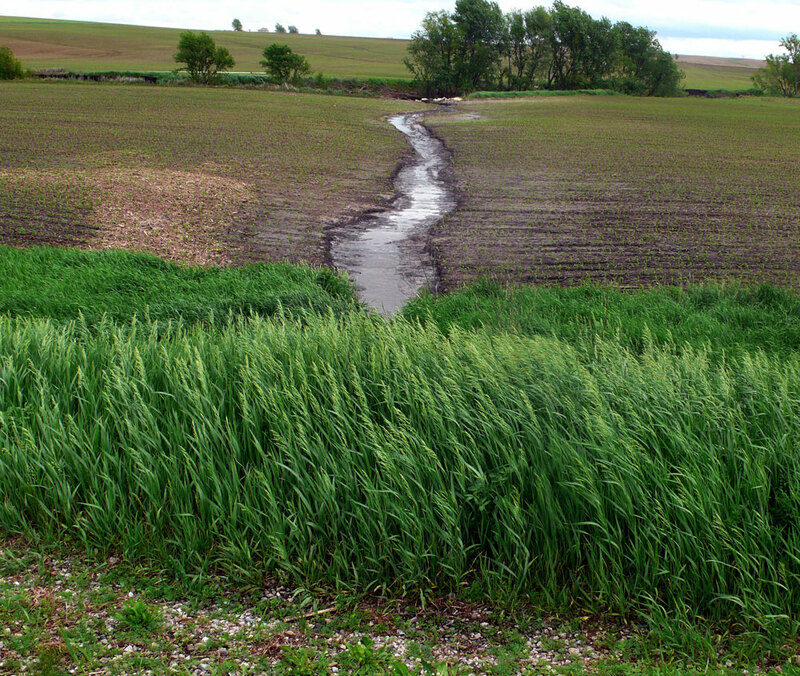 In the distance, the neighboring farmer maintains wide grass waterways to prevent similar same damage to his or her fields. Contour grass strips and terraces on this field slowed the flow of water and prevented the formation of gullies that are common on unprotected slopes. On one side of the road (bottom photo) a gully cuts through an unprotected field. On the other side (top photo) a grass waterway stops the gully but is filled with mud and rocks from the gully on the opposite side. A massive fan of mud -- eroded soil -- collected at the end of the gully cutting through this unprotected field. Many gullies connect to streams, a direct pipeline for polluted runoff. Several tons of soil fill the ditch at the bottom of this uprotected field. Cleaning up mud-filled ditches is expensive. A deep gully transports tons of soil eroded from this unprotected field. The polluted runoff enters the underground drainage system through the orange suface inlet partially buried in mud. Once the polluted runoff enters the drainage pipes, it flows to a nearby stream. 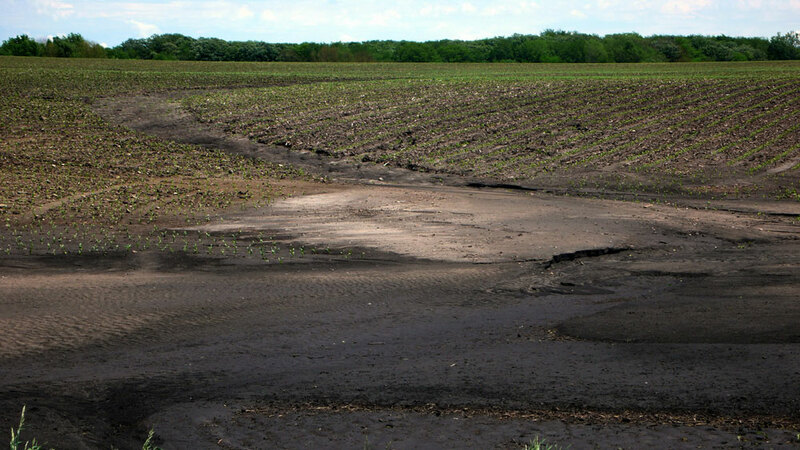 Enough soil eroded from this unprotected field to bury 2-inch high corn at the botton of the field. Mud was several feet deep in the ditch. A gully formed at the end of a broken grass waterway. Restoring the waterway would heal this gully. This properly maintained grass waterway minimized the damage caused by very same storms that gullied neighboring unprotected fields. This waterway needs help. The gullies forming on its edges defeat the protection it would otherwise provide. Terraces, grass waterways and contour strips are holding this field together despite almost 10 inches of rain in this location. This 3-inch deep gully carved tons of soil -- and all the attached farm chemicals -- from this field. A grass waterway would have prevented this. This waterway is failing. It may have been "nicked" over time, becoming narrower with each year's planting. Now it's too narrow and broken at the end, and the gullies are coming back. This gully may look small, but it can still sweep several tons of soil from this unprotected field. The orange tile intake sends silt and farm chemicals directly into streams. 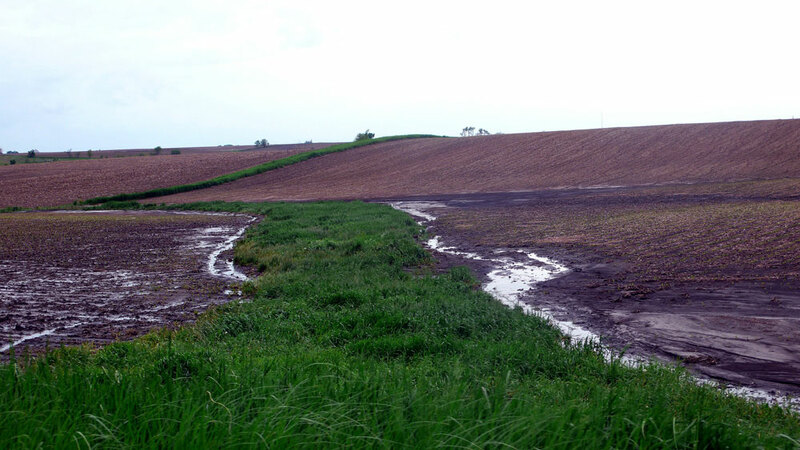 A network of wide and well-maintained grass waterways, combined with minimal tillage, left this field nearly unaffected by the heavy rains. Gullies like this form year after year in the same place when storms hit. 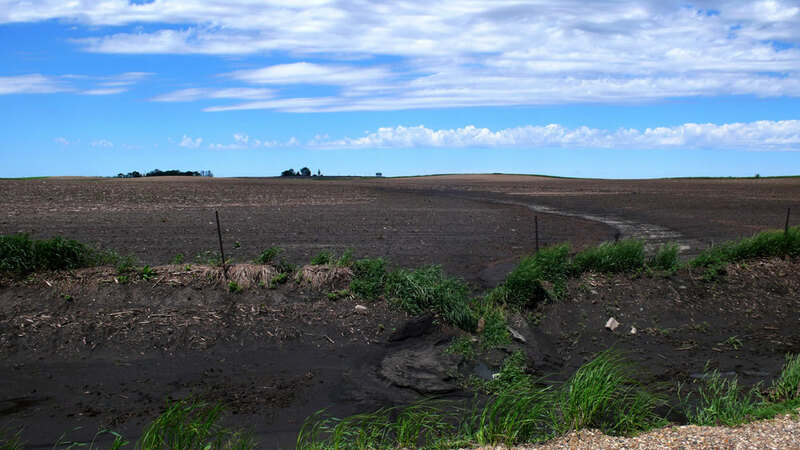 Farmers smooth them out again, but without better conservation the soil erosion and polluted runoff continues. 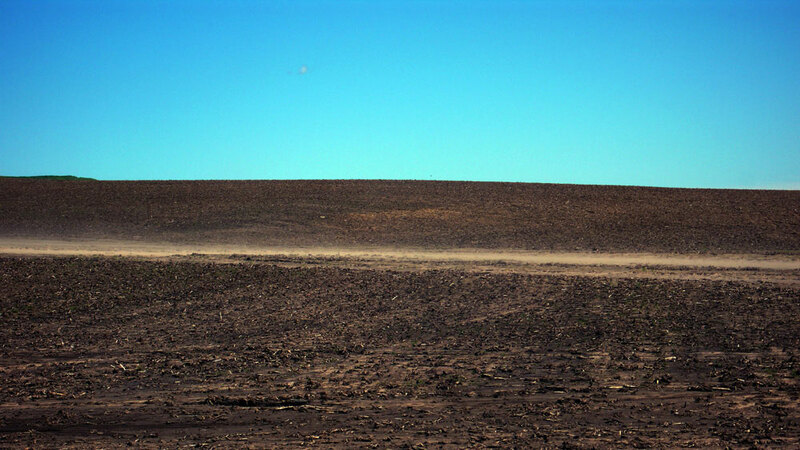 A 3-to-4 inch deep fan of mud fills the bottom of this large, steep and unprotected field. Multiple gullies scar the sloping field at this location. This grass waterway needs maintenance. Runoff water is flowing around it rather than through it. 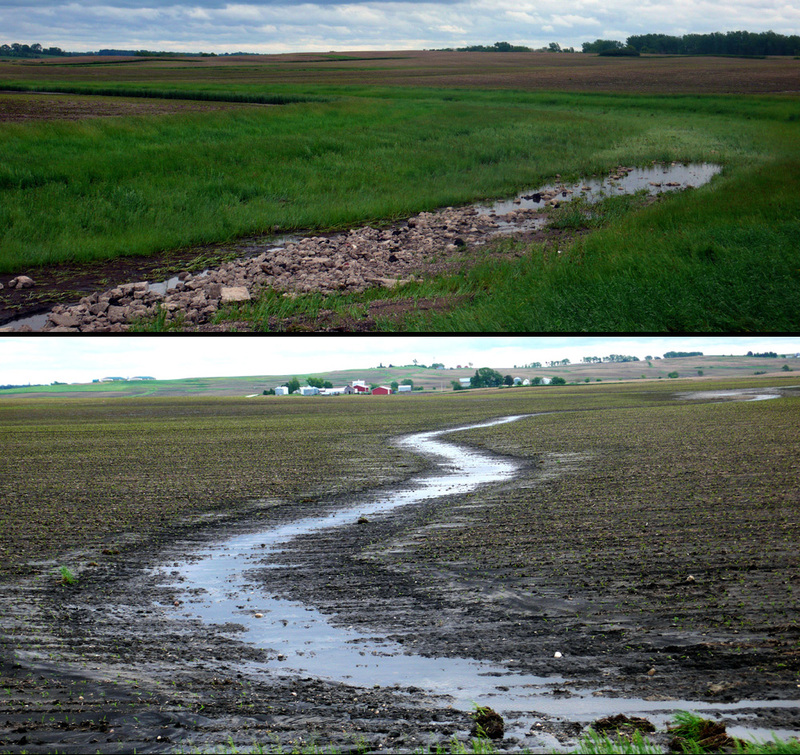 Here a combination of no-till and grass waterways prevented erosion and polluted runoff despite the heavy rains. 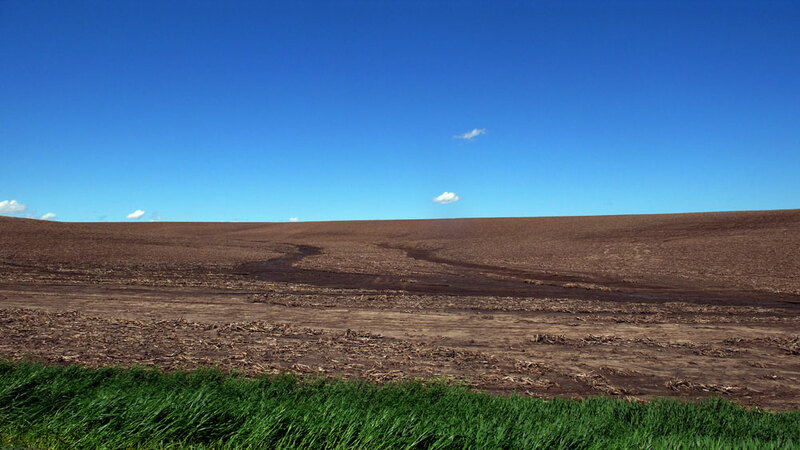 A series of terraces and field-wide no-till practices protected this field from the heavy rains. A strong network of grass waterways, proper residue management and no-till practices protected this recently planted field from the storms that gullied adjacent fields. This particularly bad gully stripped 2-to-3 inches of soil from the lower portion of this field. Most of the soil ended up in the road ditch, from which it will be carried into streams over time. 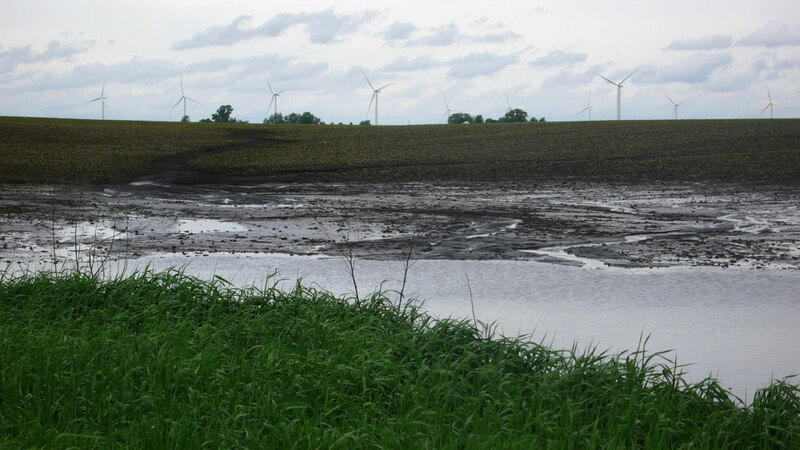 A fan of eroded soil and a pool of polluted runoff collects at the end of a gully stretching back toward the wind turbines. 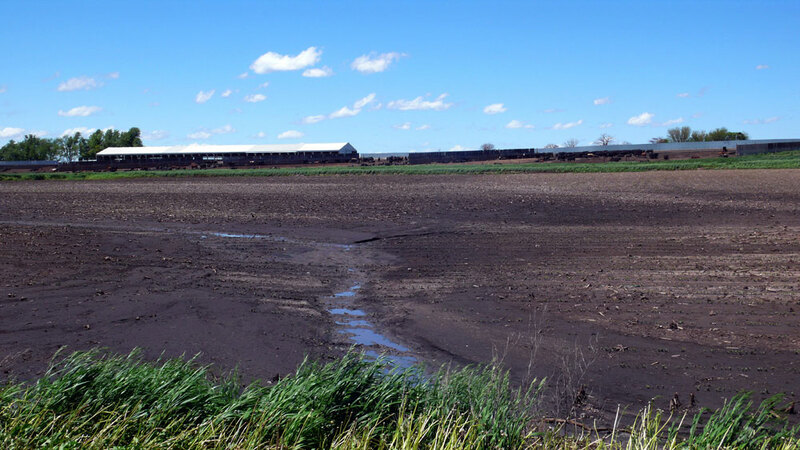 Runoff carrying mud and farm chemicals continues to cut through this field two days after the rains. A pile of crop residue collects at the bottom of this gully. Minimum or no-till practices alone didn't protect this field. Additional conservation practices are needed. 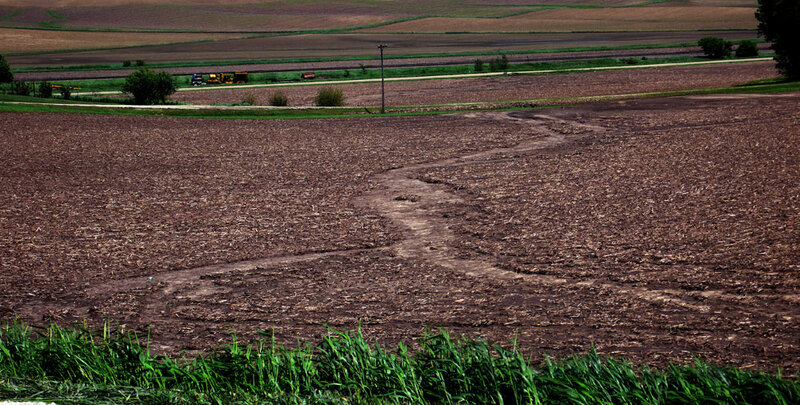 A deep gully snakes its way through this unprotected field, carrying away tons of mud and farm chemicals. A grass waterway would fix this. A few more yards of the grass waterways protecting the fields in the distance would have prevented the gully cutting through prime farmland. A deep gully formed at the end of a grass waterway that ends too soon. 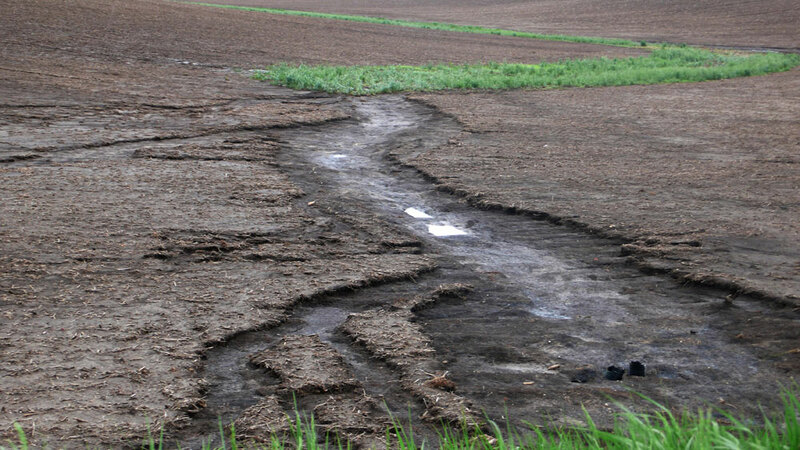 Broken waterways can make gullies worse. 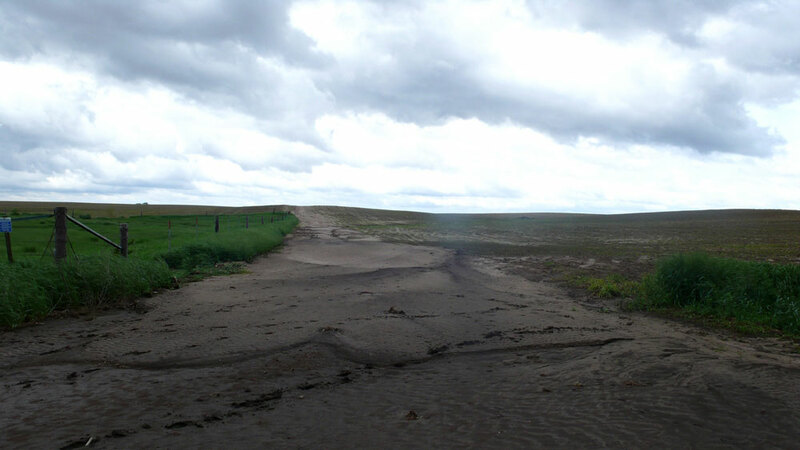 Another case of a broken grass waterway that resulted in severe erosion where the waterway ends. This 1-to-2 inch gully, almost 20 feet wide in places, runs all of the way across this field and into the next. Multiple gullies cut into this field, delivering polluted runoff to the orange tile inlet in the foreground. 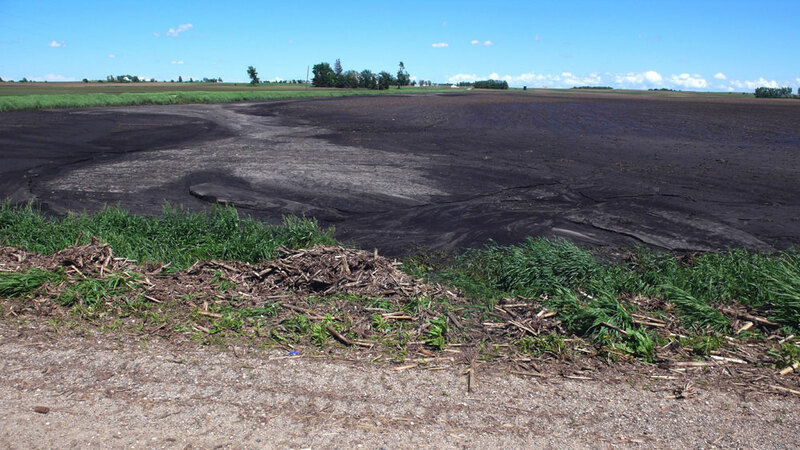 A 6-to-8 inch deep pile of mud was stripped from this unprotected field, threatening productivity and water quality. A good grass waterway protected this field from gullying, despite signs that grass is being nicked along the edges of the waterway. 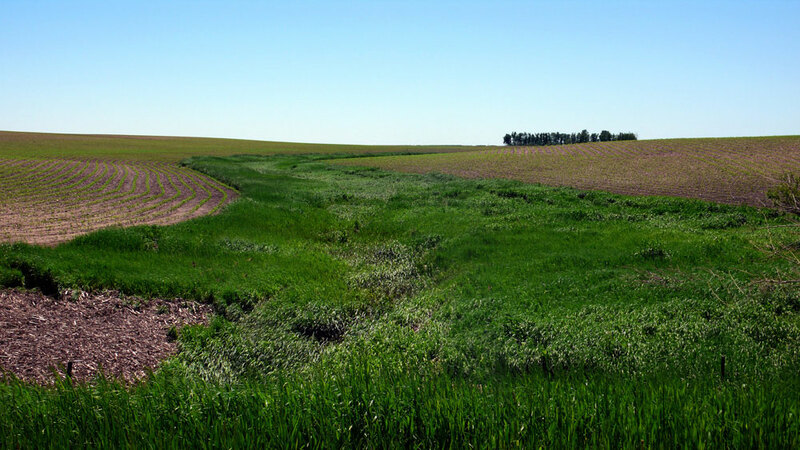 Here grass waterways, a wide stream-side buffer and contour tillage combined to protect soil and water despite heavy rains. 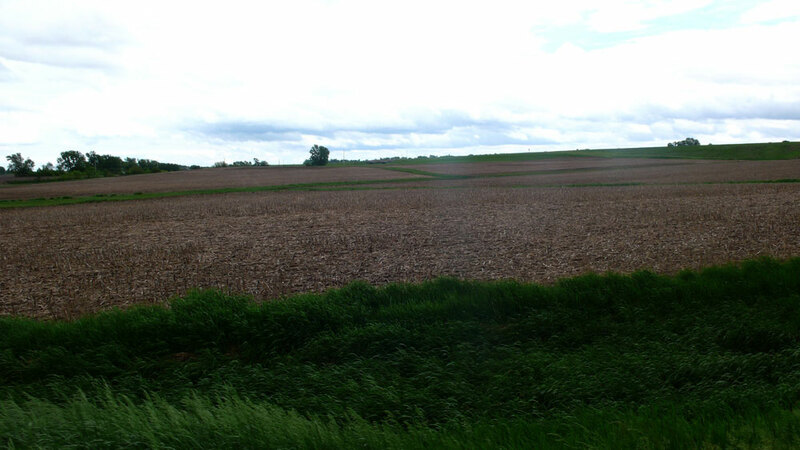 Last year's crop residue -- with tall stalks left in the soil -- helped protect this field. 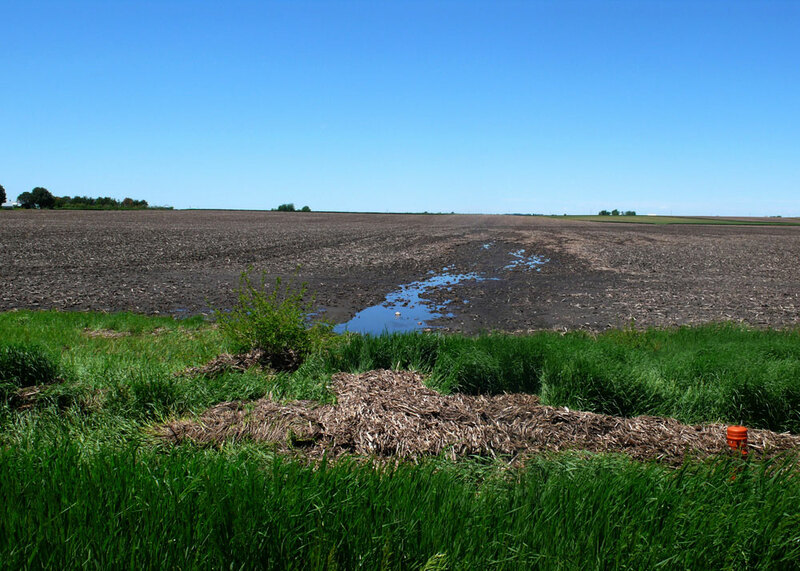 No-till and residue management help prevent soil erosion and polluted runoff. Runoff converging from two gullies overwheled a terrace that had not been maintained. Mud and polluted runoff pooled at the bottom of a gully cutting through this unprotected field. 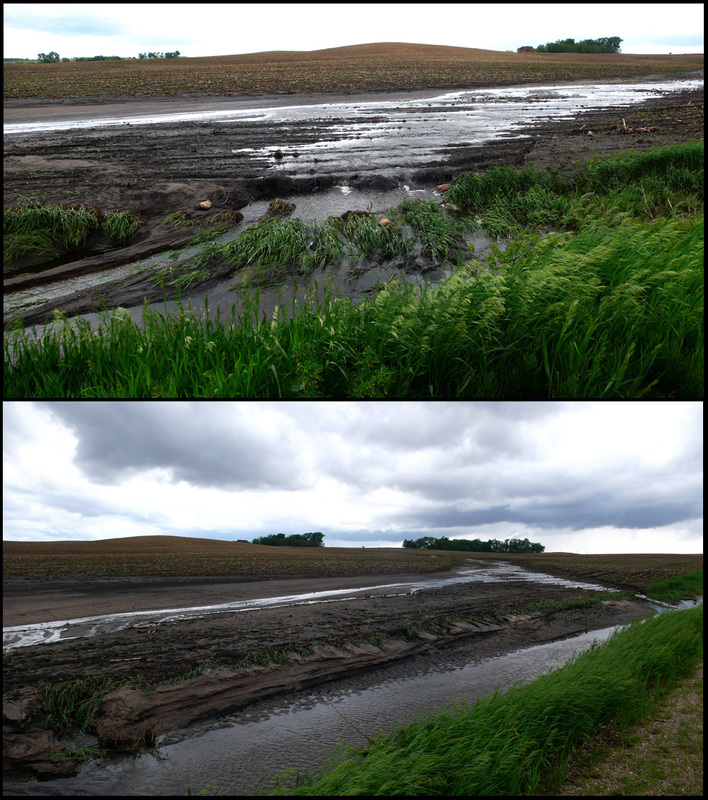 Polluted runoff spilled off this poorly protected field (top photo) and deposited tons of eroded soil at its edge. The layering of the mud suggests this has happened repeatedly. 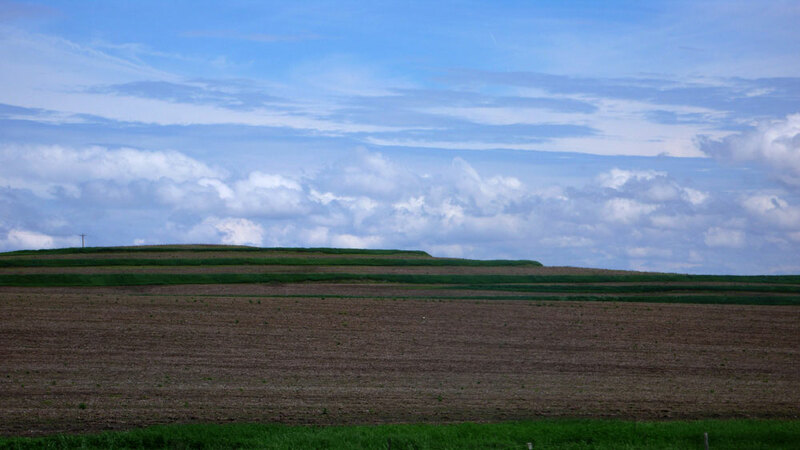 Multiple gullies converged to deposit a wide fan of soil several inches deep across the bottom of this field. The last remnants of what might have once been a grass waterway are buried in the mud at the end of this very expansive gully. Flowing water traces where a grass waterway is needed. Another broken waterway ends in gully. What at first glance looed like a small gully delivered a massive fan of eroded soil. Polluted runoff poured off this poorly protected field from gullies that cross this field from two directions. Residue management alone was not enough to prevent this gully. 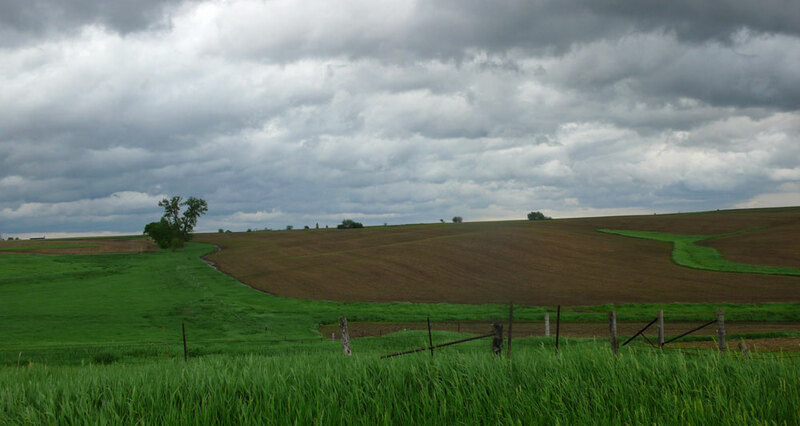 Even gently sloping fields need protection when heavy rains fall. 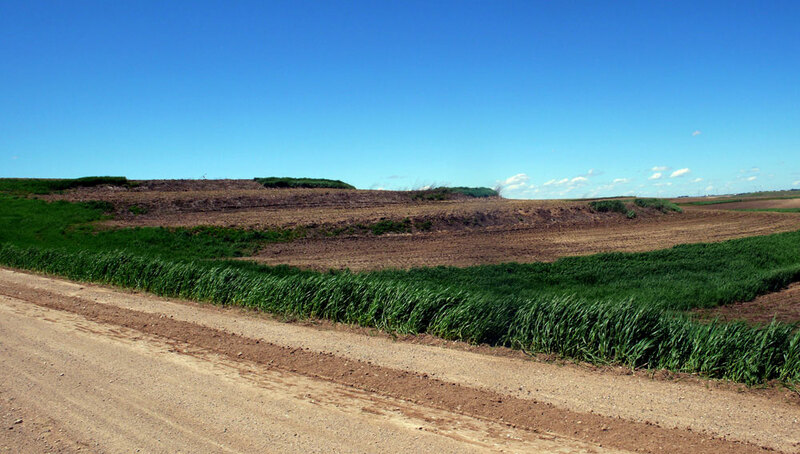 A lack of protective conservation practices left a large portion of this field's best soil in the roadside ditch. 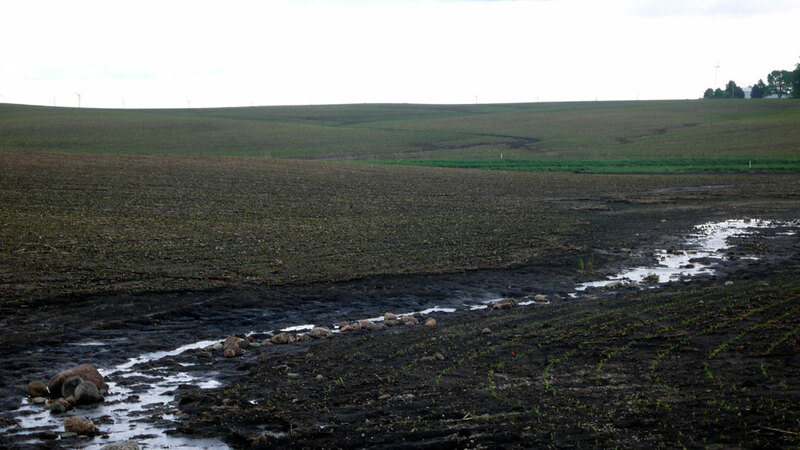 Multiple gullies converged in a wide fan of deposited soil deep enough to cover the young corn plants. Crop residue alone was not enough to protect this field. Residue is piled in the ditch and the polluted runoff went down the orange tile inlet on its way to a stream or river. A gully cut through a failing grass waterway. The landowner seems to have made a dam of piled rocks in an ad hoc attempt to stop the resulting erosion. 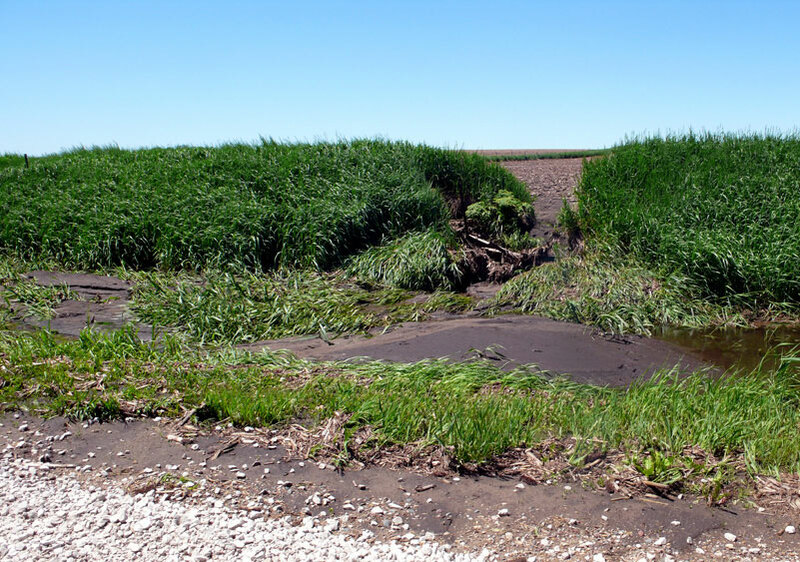 Runoff broke through a 2-to-3 foot-thick berm and completely filled the road ditch with mud. 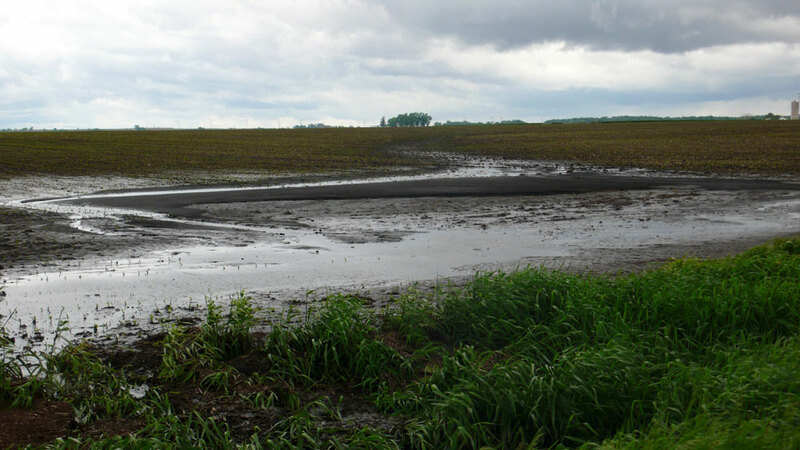 Even good residue management is no longer enough to protect soil and water; supporting practices such as grass waterways and buffers are needed to stand up to heavy rains. A combination of contour strips, small terraces and contour tillage left this field in good shape, despite being highly erodible land. 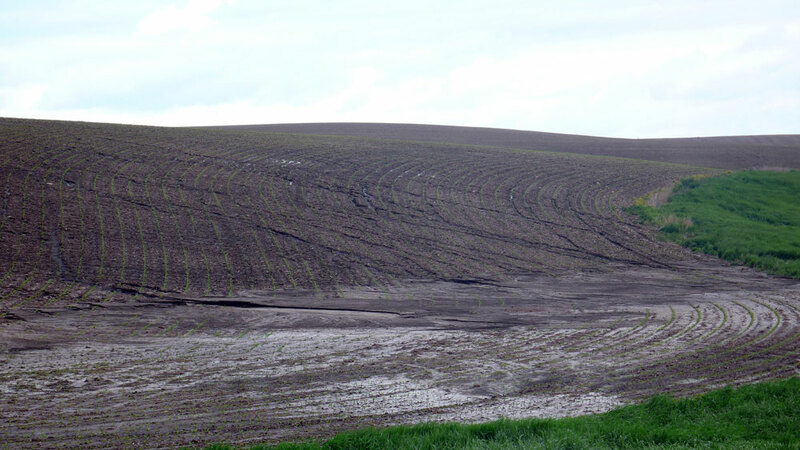 Soil left by gullies cut between crop rows planted directly downhill and settled in waves at the bottom of this field. This grass waterway suffered some damage from heavy rains, but it still kept the soil in place. 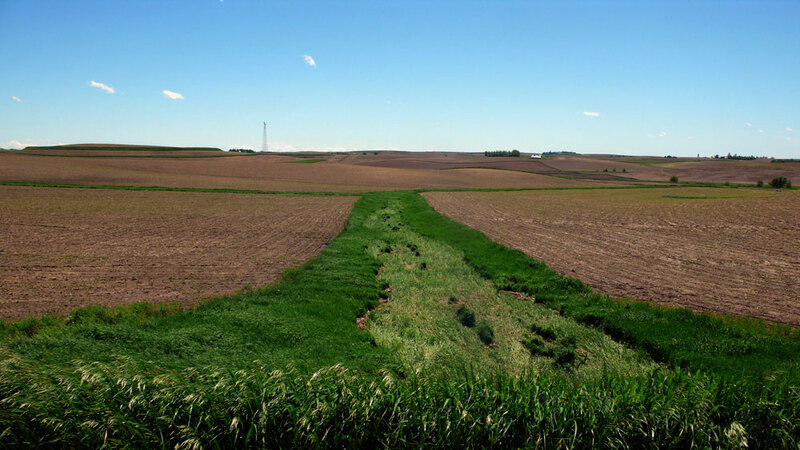 Iowa soil filling a ditch -- instead of growing crops. 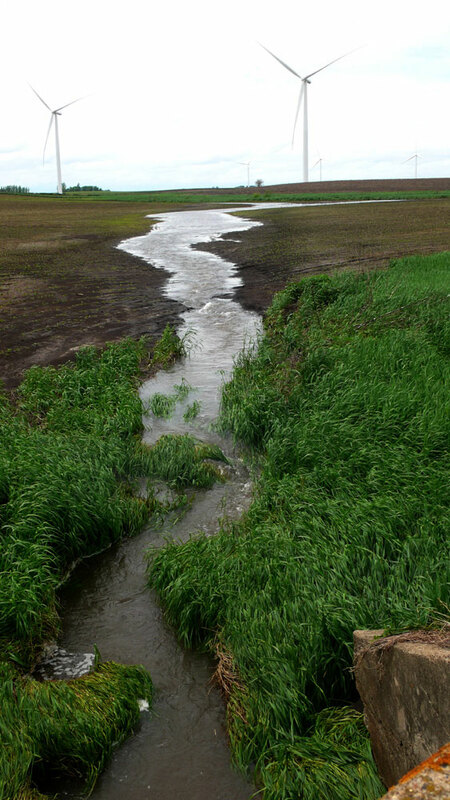 Gullies that start out small can rapidly grow in size and depth as they cross a single field. 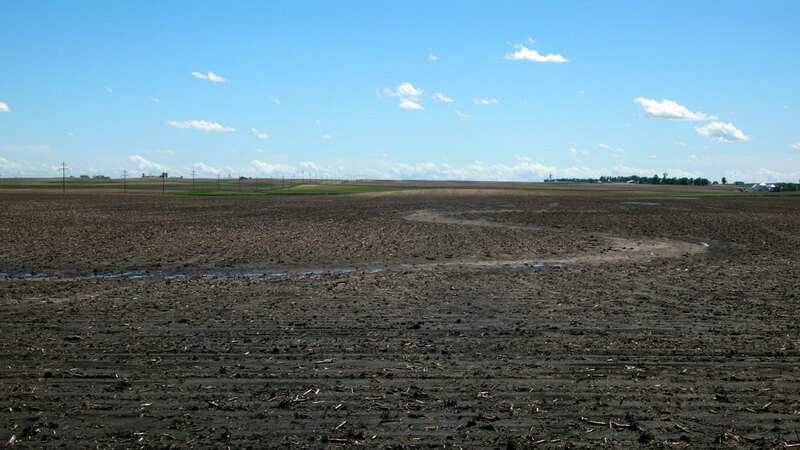 A compelling example of why highly erodible land should be required to employ conservation practices to be eligible for crop insurance subsidies. Multiple small gullies converged into a 30-to-40 foot wide supergully. There is not a single good conservation practice in sight. Another 30-to-40 foot wide gully. Once again, there is not one conservation practice in sight. 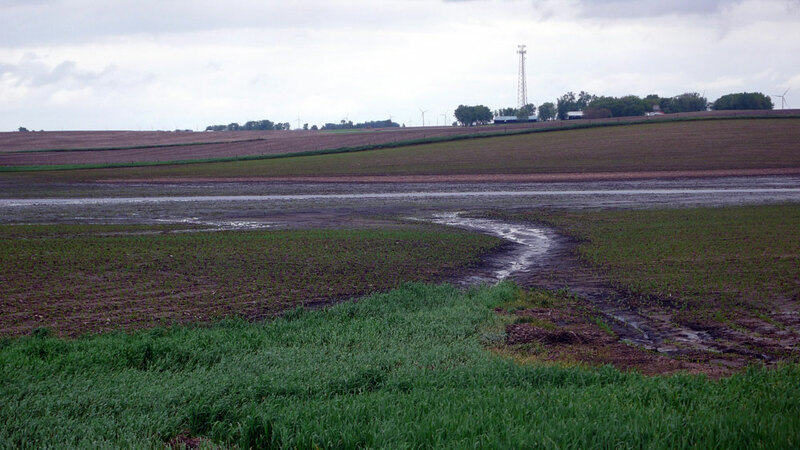 A proper network of grass waterways, contour tillage and good residue management protected this field from serious erosion and runoff. Good conservation can stand up to even heavy rains. Terraces, grass waterways and good residue combined to protect this field from the heavy rains that caused so much damage on neighboring fields. This waterway will need a little maintenance but still worked to protect this field from what likely would have been very serious erosion. 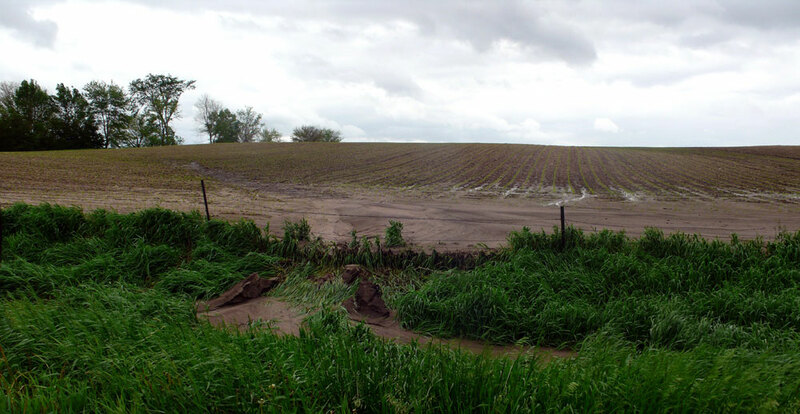 A network of terraces and grassed waterways prevented serious damage despite several rains of more than 4 inches. 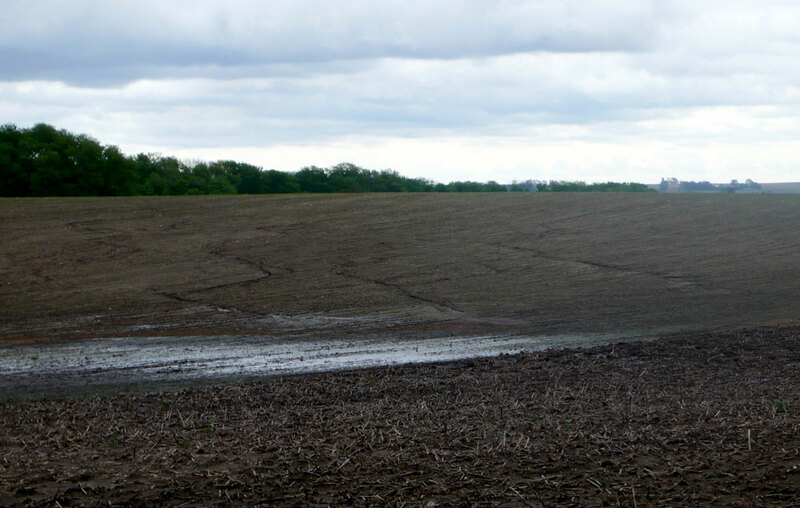 Multiple storms deposited -- and then further eroded -- 4-to-6 inches of soil at the edge of this large, unprotected field. This waterway is deteriorating, probably from overuse of herbicides. 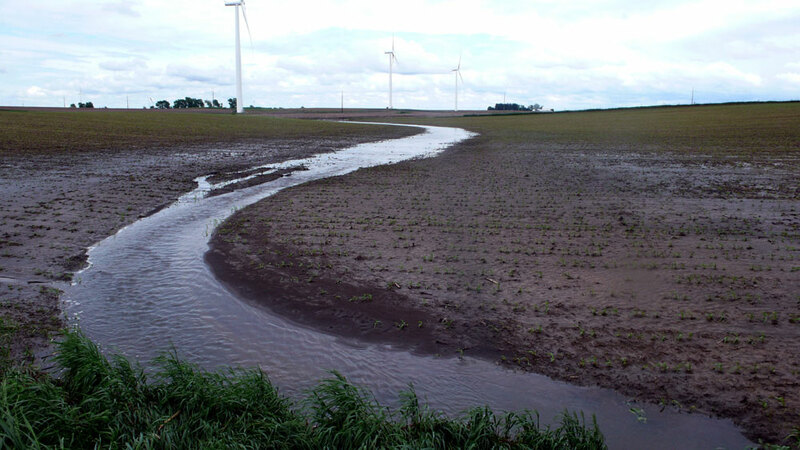 Even slow-moving water in flat fields can encourage a significant amount of erosion if conservation is ignored. Mud and runoff water fill a road ditch. A shallow gully marks the location of a much-needed grass waterway. Sheet and rill erosion, which occurs when water runs off fields in sheets rather than cutting gullies, still carried lots of soil into a roadside ditch. Crop residue that failed to protect this field is piled in a roadside ditch. 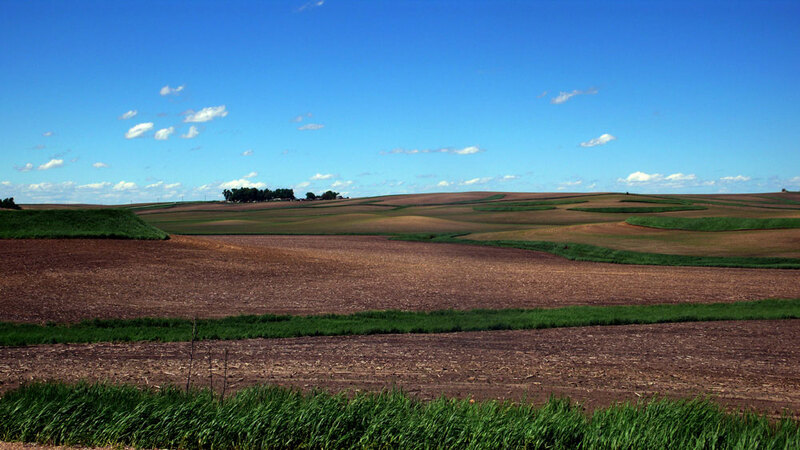 Soils like this exist only in the American Midwest. Too much of it ended up in ditches and streams this spring. 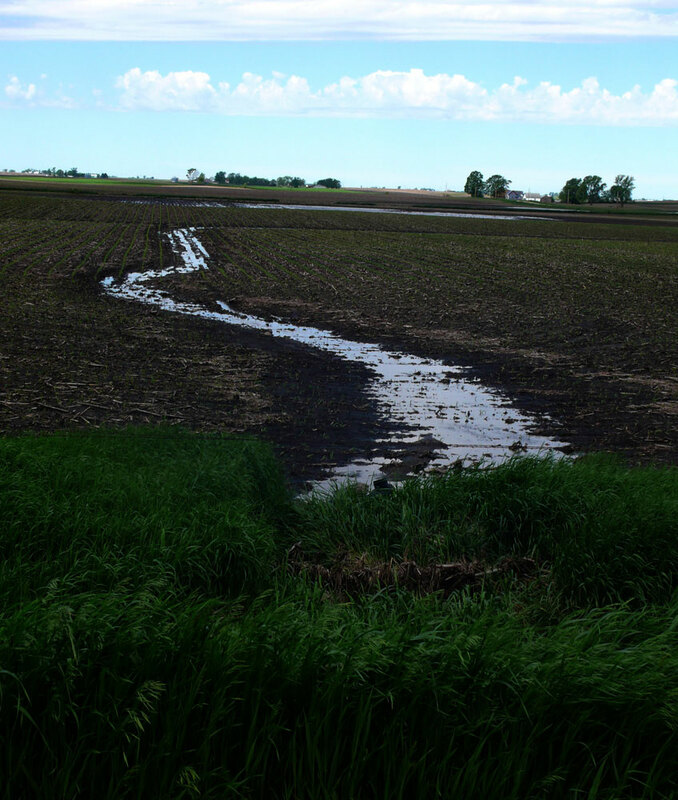 A gully cut through this field and polluted runoff filled the ditch, perhaps on its way to the nearest stream. A wide fan of soil was deposited in the roadside ditch at the base of this highly-erodible slope. Gullies coming from each direction converged on the last remnants of a grass waterway that had degraded due to lack of maintenance. Severe gullying left behind WHAT???? the size of soccer balls in this poorly protected field. A gully cut through where a grass waterway may have been in the past. 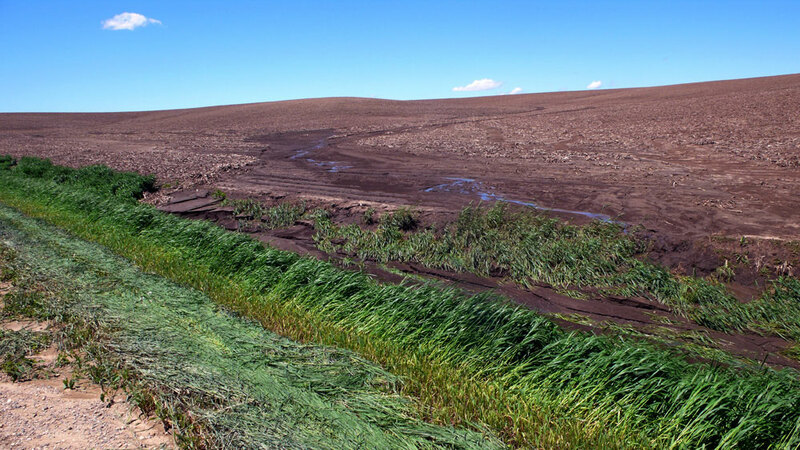 Despite obvious torrential water flows, this grass waterway protected this field from heavy damage. The waterway may need help to heal the damaged grass. This waterway is beginning to fail. 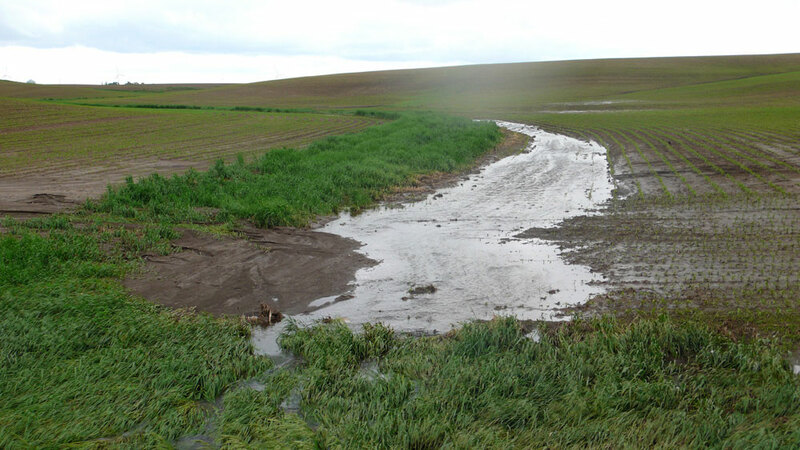 Runoff is running outside the waterway, cutting a gully as it flows down the field. 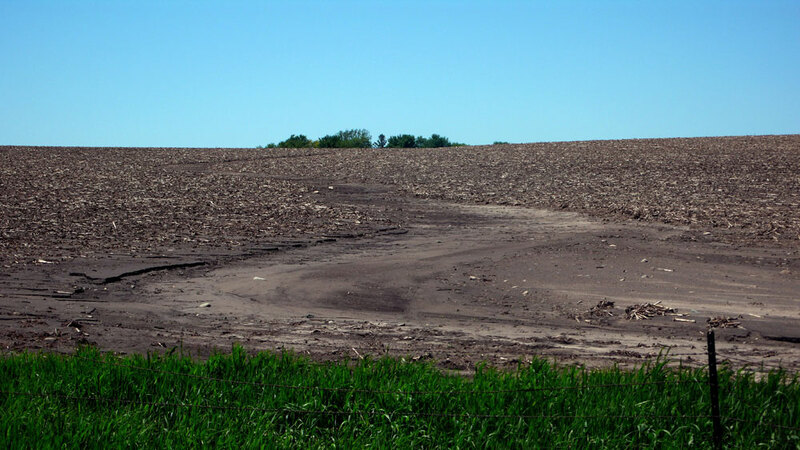 This gully swept back and forth across the field, depositing 4-to-6 inches of soil at its edge. 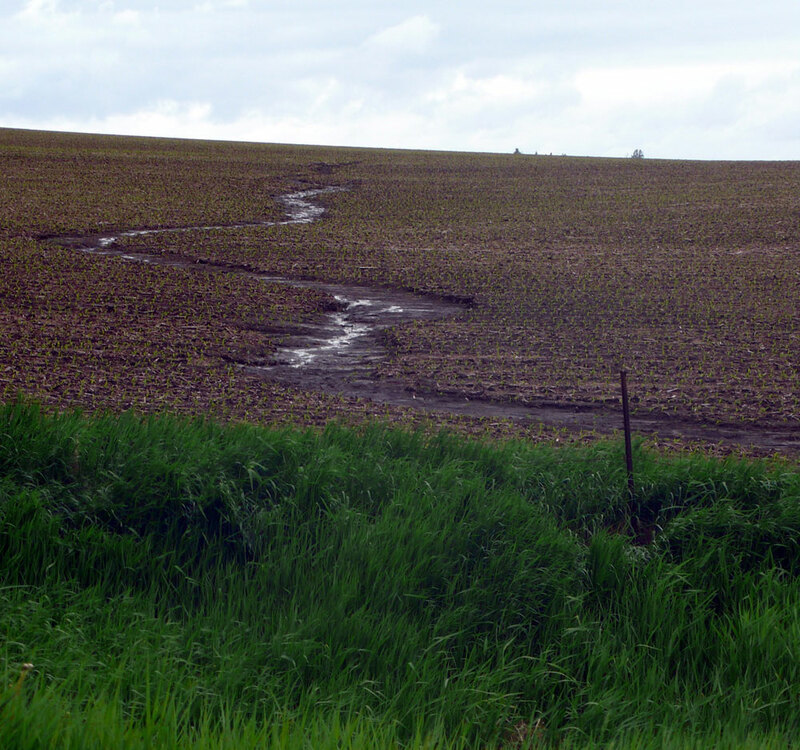 Deep gullies between corn rows planted downslope deposited 4-to-6 inches of soil on top of emerging corn plants. The lighter sandy soil marks where a gully flowed; the lighter soil is already blowing away in the wind. Neighboring farms had well-planned and connected terraces and grass waterways. 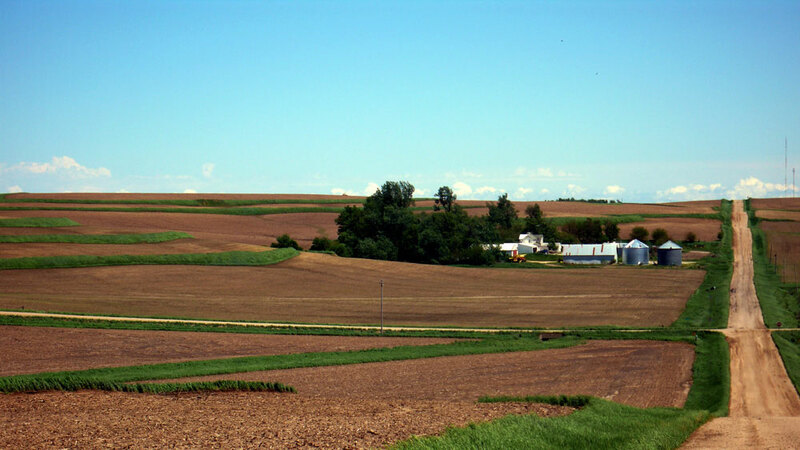 Everyone's fields benefitted from the cooperative effort. Terraces in need of maintenance. Chemical overspray may have killed the grass cover that protected the terrace from failure. A massive fan of soil settled at the end of a long gully. 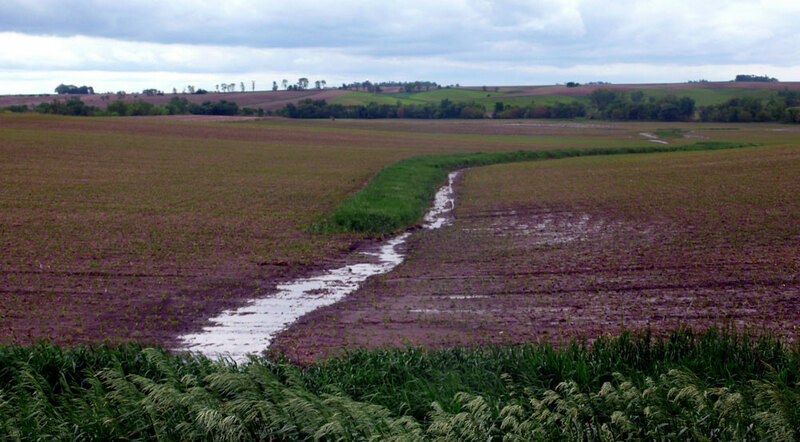 Neighboring fields that used terraces and grass waterways showed no similar problems. 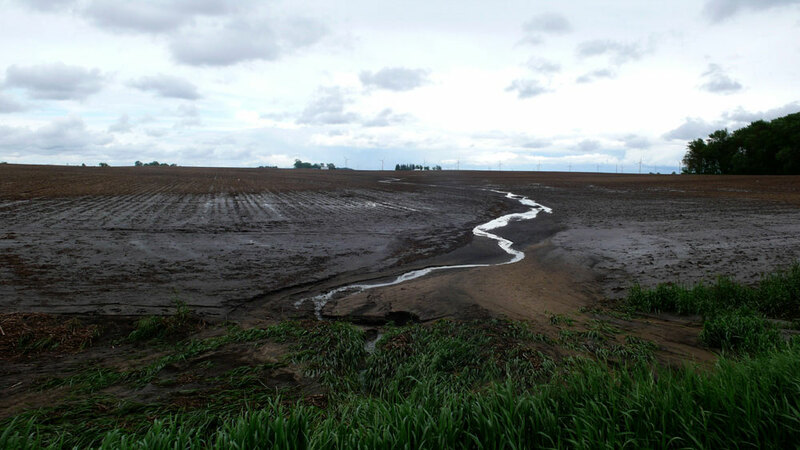 These fields are classified as "highly erodible land," but terracing and waterways prevented serious damage despite several rains of more than 4 inches. This gully snaked back and forth across the field. 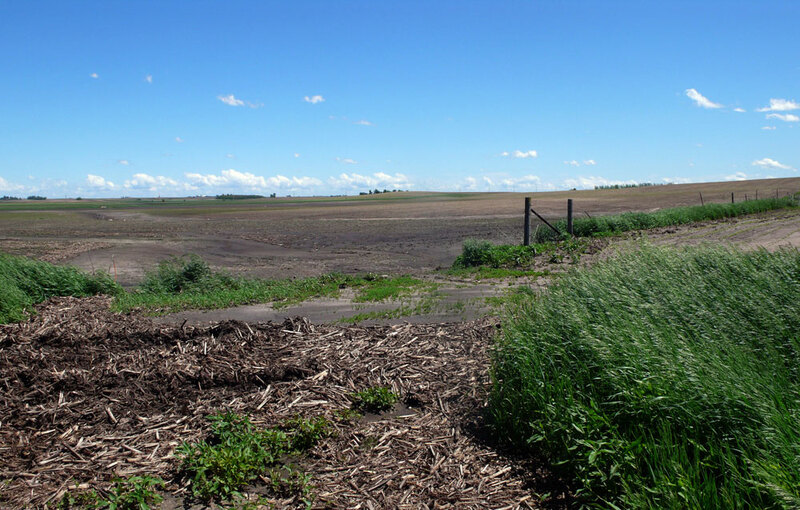 There is one important silver lining to this otherwise dark cloud – where conservation practices were in place and properly maintained, they clearly worked. 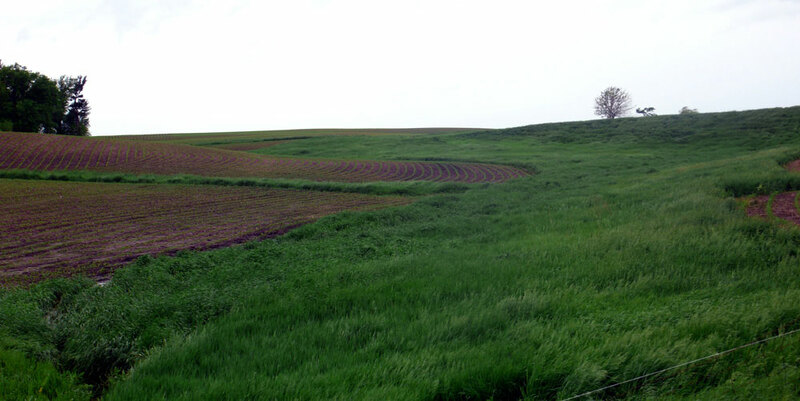 No-till, grassed waterways, terraces, contour grass strips and other buffer practices – especially in combination – were very effective in stemming the gully erosion and runoff that was prevalent on unprotected fields. 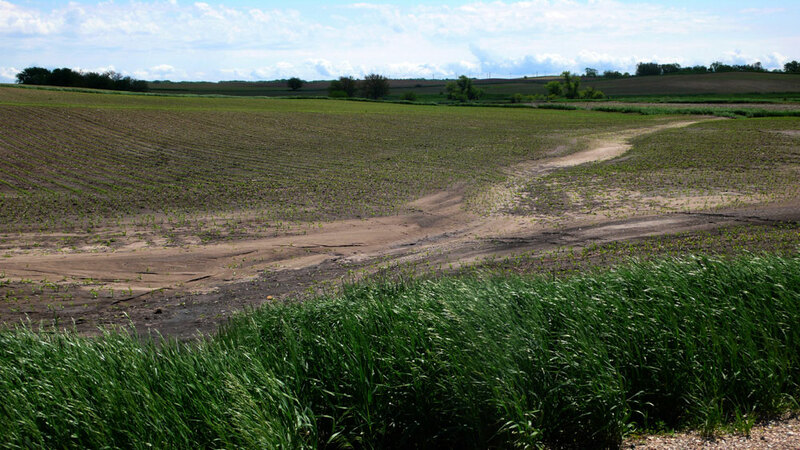 Every no-till field with properly placed grass waterways showed only nominal signs of erosion. 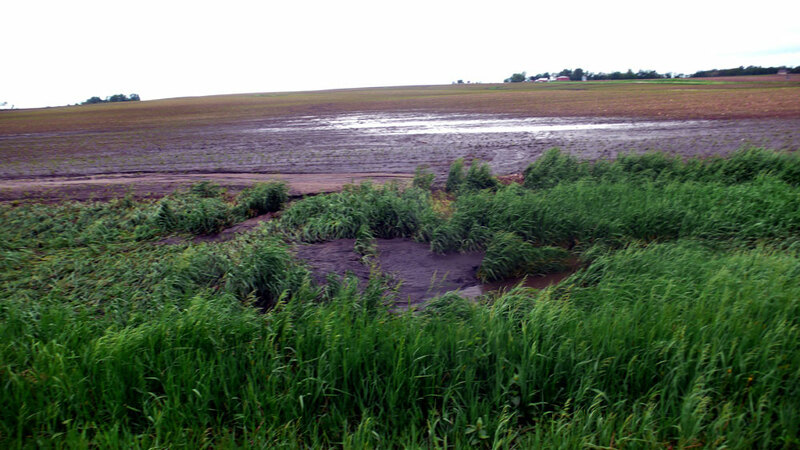 Well-protected fields suffered little damage even where poorly protected fields just down or across the road had suffered badly. 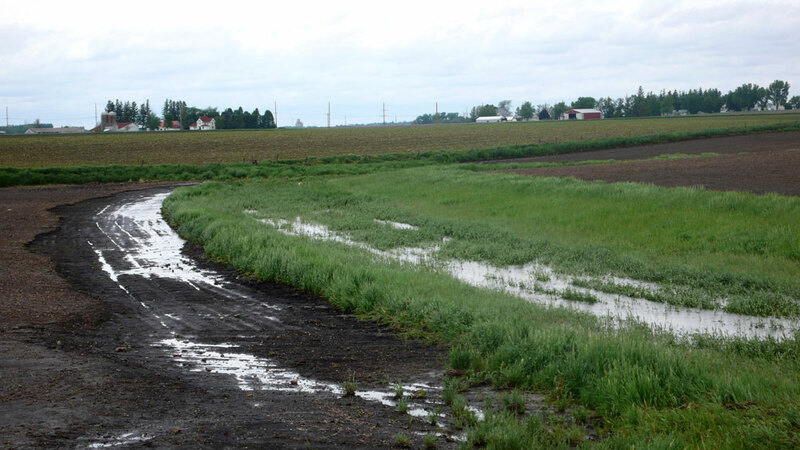 Landowners can’t control how much rain falls on their fields, but the pictures clearly show that they can do a great deal to protect those fields from erosion and to keep polluted runoff out of Iowa’s streams, even in the heaviest rains. 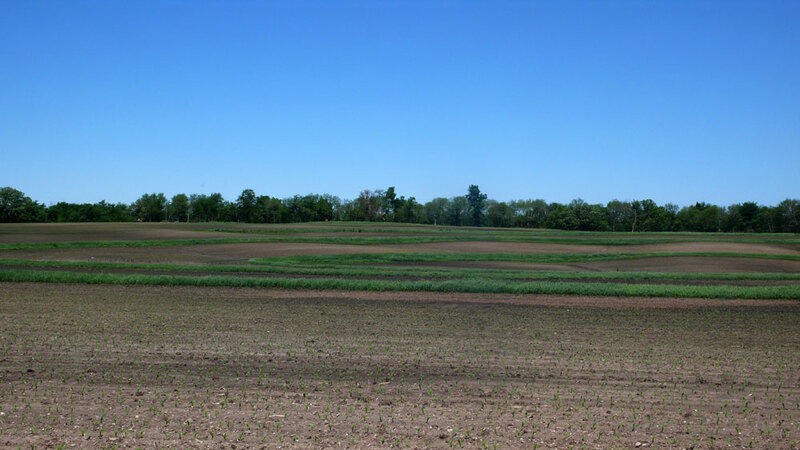 Proper no-till management of contours and grass buffers are well-established conservation practices that would have effectively protected most of the fields EWG observed from the five days of intense rain. This damage documented in these photos simply did not need to occur. Heavy rain is nature’s doing, but the resulting erosion and polluted runoff is entirely a man-made disaster. 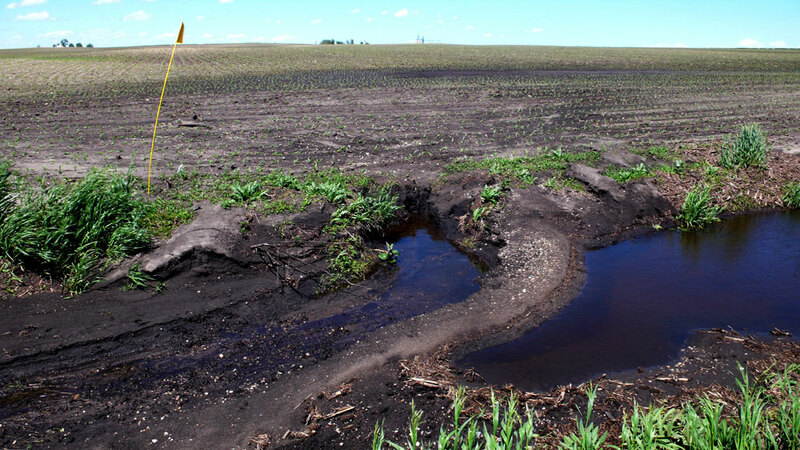 The battering that Midwest soils and streams have taken this year hasn’t made national headlines, but it has not gone totally unnoticed. 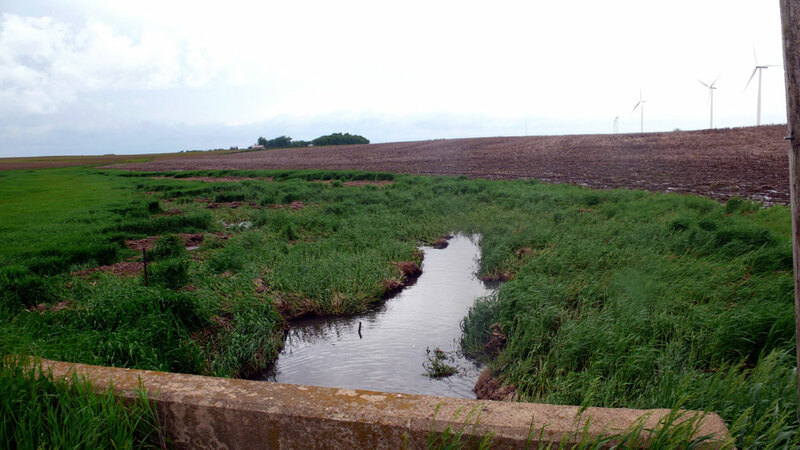 Data showing that the amount of nitrate in Iowa streams was at record levels also made the news. The Des Moines Register reported that the “deluge is washing fertilizer off the farms and into rivers that provide drinking water to much of the state.” Bill Stowe, manager of the Des Moines Water Works, which serves about 500,000 people in central Iowa, noted that nitrate levels in the city’s source water were “the worst we’ve ever seen.” The Water Works draws water from both the Des Moines and Raccoon Rivers, which were reporting record high levels of nitrates. 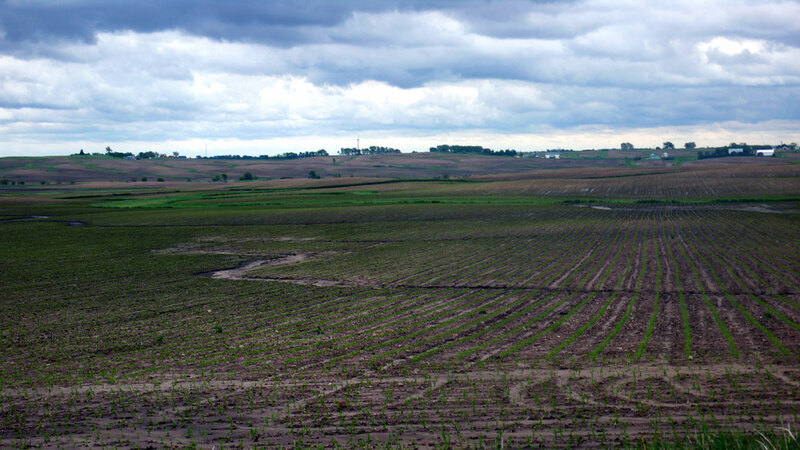 The threat to Des Moines’s drinking water is part of a much larger story about agriculture’s impact on drinking water in the Midwest. 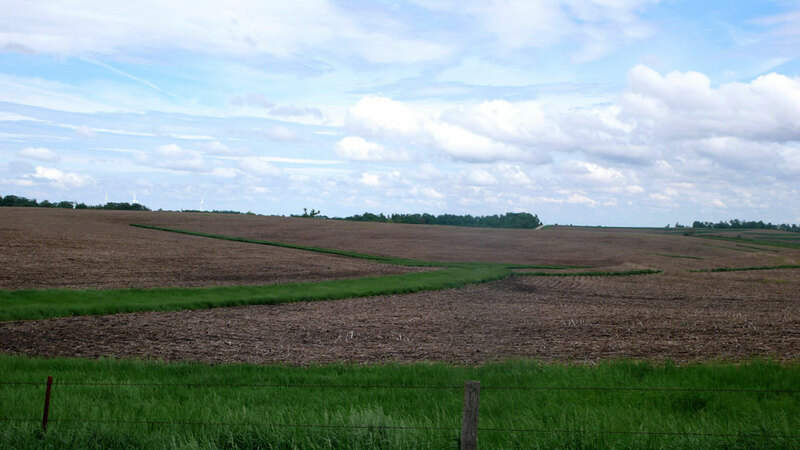 By 1975, Iowa had lost fully one-half of its topsoil to erosion due to bad tillage practices over the preceding 75 years, but from the 1970s to the 1990s farmers made great progress in reducing soil erosion and runoff. Conservation efforts during that period could not undo the damage, but they worked to keep things from getting worse. Still, there was no room for backsliding due to budget cuts or market changes. 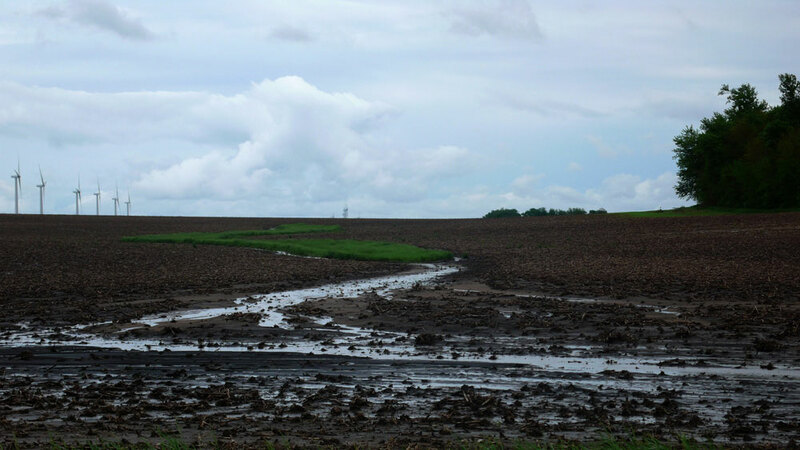 Today, however, the gullies scarring Midwest fields are only the most visible evidence that conservation is not keeping up with a new wave of soil loss as high crop prices spur farmers to plant every square foot. It is great to see farmers making money – real money, in fact. But conservation efforts must intensify in lockstep with rising production or today’s profits will come at the expense of soils, streams and the region’s future. 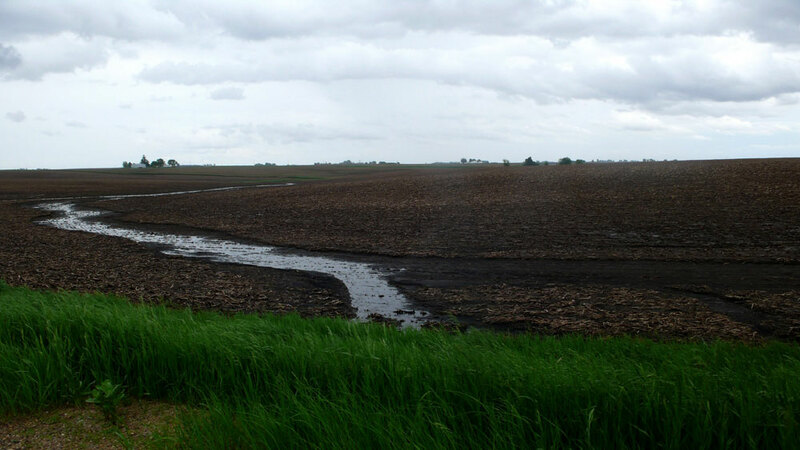 The heavy rains that pummeled farmland this spring are predicted to grow in frequency and severity. 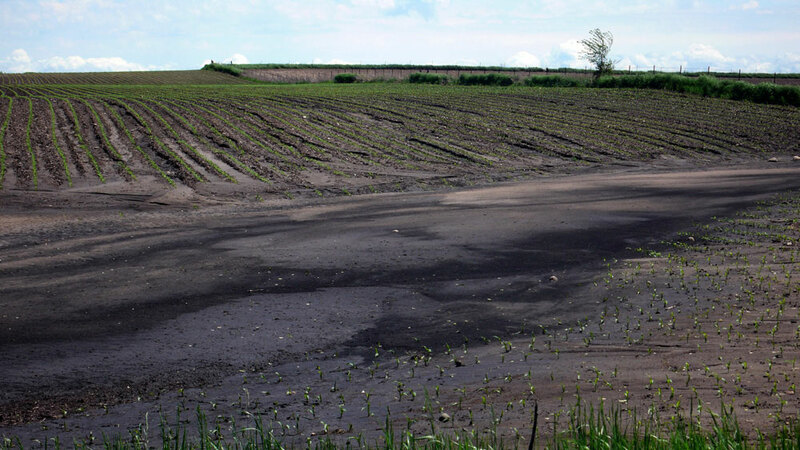 It will take the application of multiple conservation practices working in combination on every farm to protect soil and water from this dangerous trend in the weather. 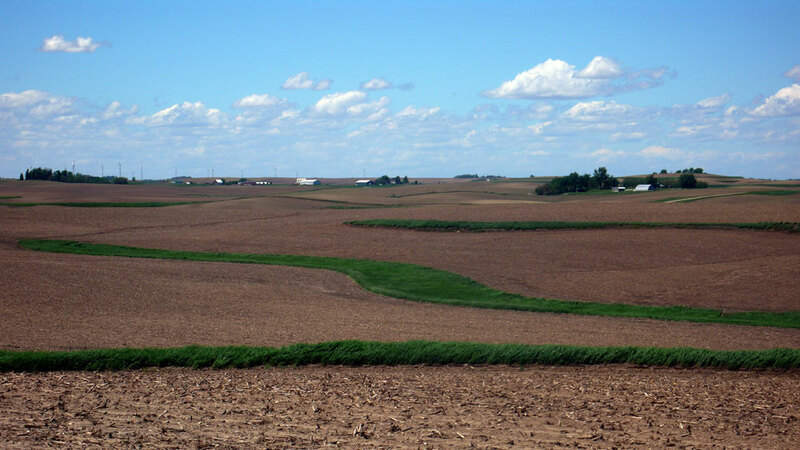 Landowners do have the tools to take advantage of high prices while still keeping the soil on their fields and out of America’s streams and rivers. 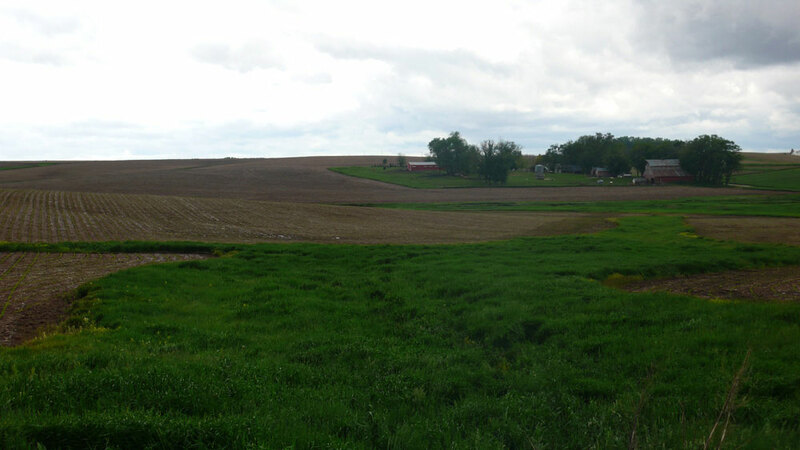 Widespread use of the simple, conventional conservation practices frequently visible during EWG’s roadside erosion tour would go a long way toward that goal – while also reducing nutrient, chemical and manure runoff. 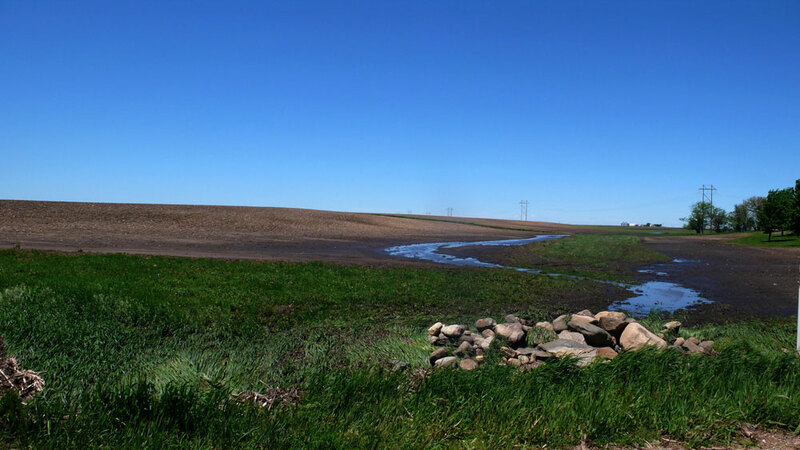 EWG’s drive around the Iowa showed that growers also have a long way to go to protect against the fury of the storms that threaten the state’s soil and streams each spring. It is time to set the alarm bells ringing – again. 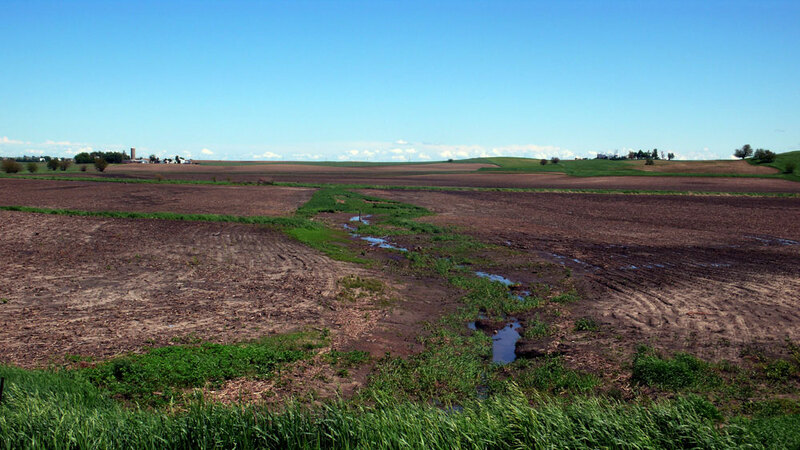 It is time to require that every landowner, no matter the size of the farm or the type of crop, employ at least basic conservation practices to stem gully erosion and minimize runoff. 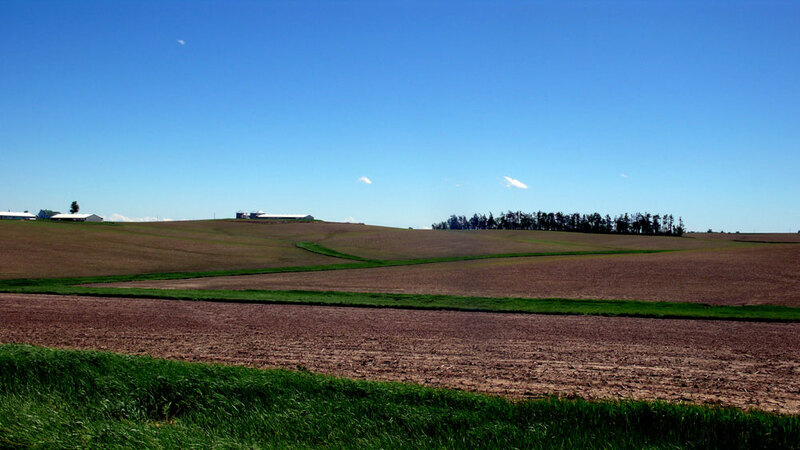 Full enforcement of the so-called “conservation compliance” provisions of the current farm bill is a good place to start. 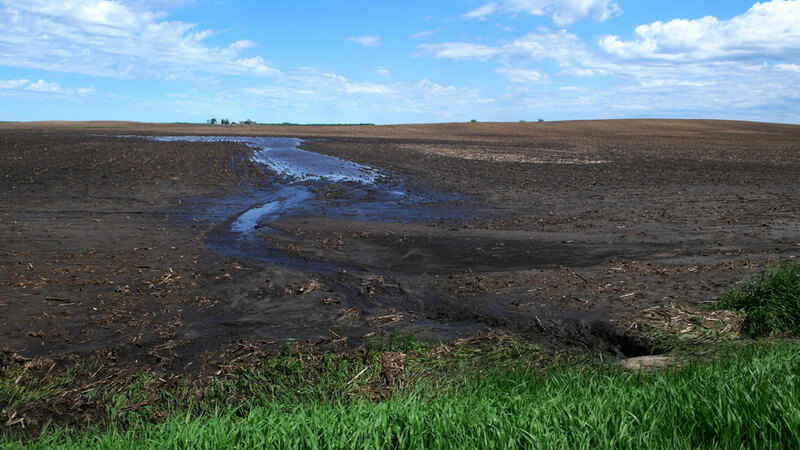 These provisions, first enacted in 1985, ask farmers to take simple steps to cut erosion and runoff from their most vulnerable cropland as a condition for receiving the farm subsidies that bolster their incomes. 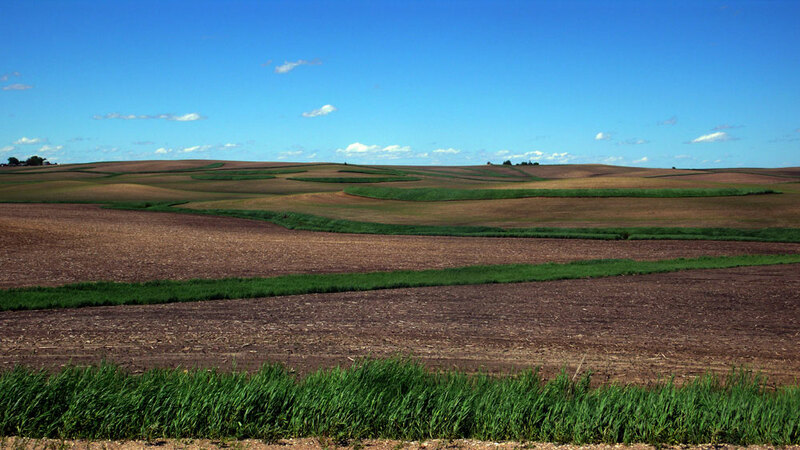 When it was fully enforced, this long-standing quid pro quo succeeded in cutting soil erosion by 40 percent on the most highly erodible cropland. It is past time to get serious again about the honoring this straightforward bargain. 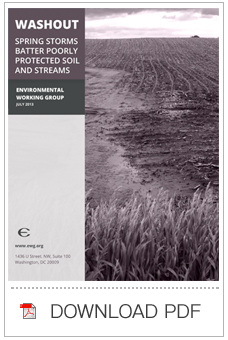 Many of the fields EWG surveyed are likely subject to the conservation quid pro quo, but enforcement appears to be spotty. Moreover, it is essential that this quid pro quo be reattached to the generous crop insurance subsidies that have become the most expensive way that taxpayers support farm income. Iowa doesn’t have to wait for the federal government to act. 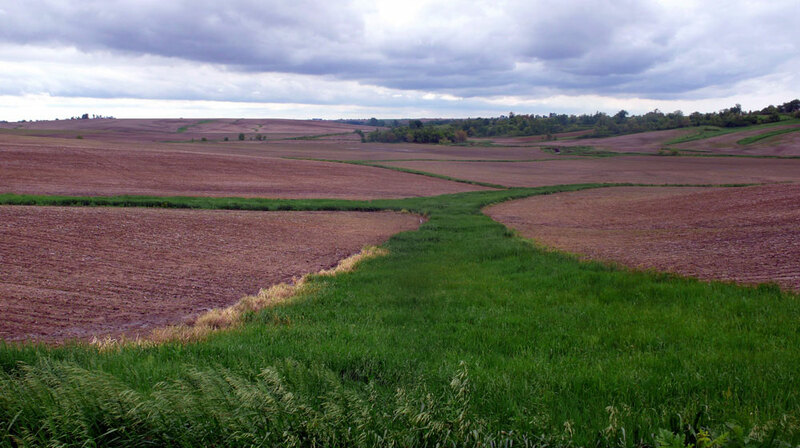 Conservation districts should fully employ their existing authority under Iowa’s Soil Conservation District Law, and the governor and the legislature should work together to give the law more teeth. The solution to this problem does not require decades of research and preparation. 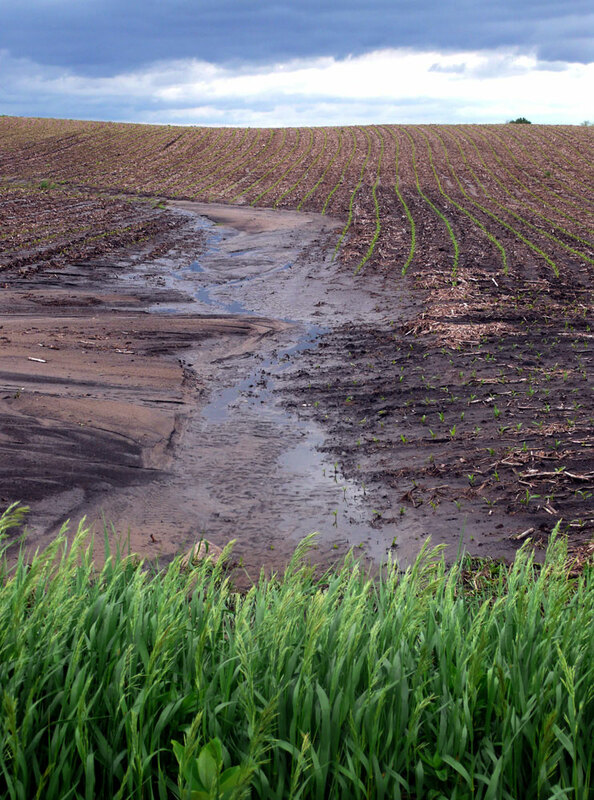 By using practices and techniques already employed profitably by many (but not enough) farmers around the country, farmers across Iowa could stem the tragic legacy of environmental abuse that starts with erosion and finally see some improvement in the state’s water quality. All we lack is leadership and political will.